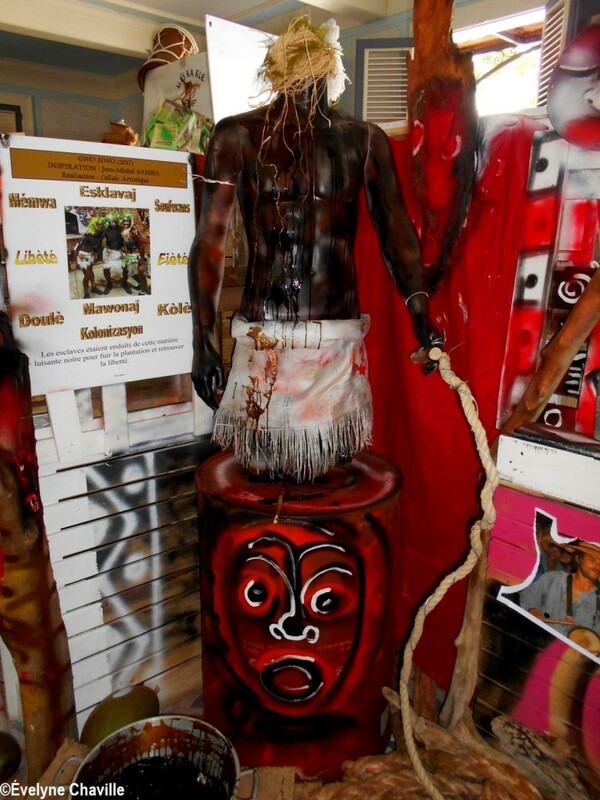 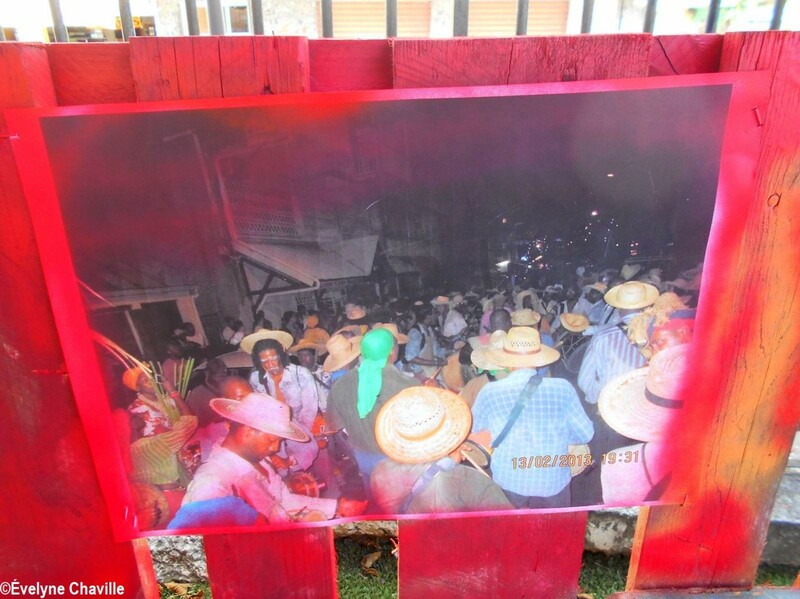 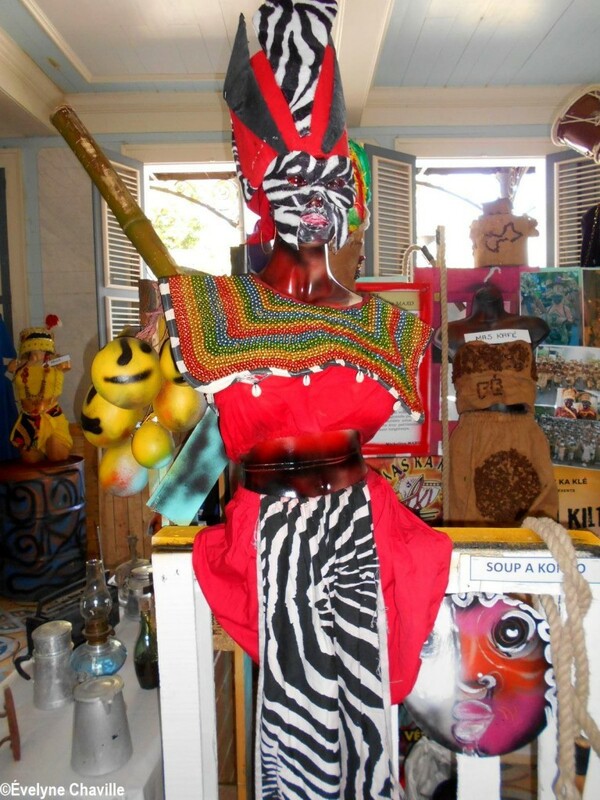 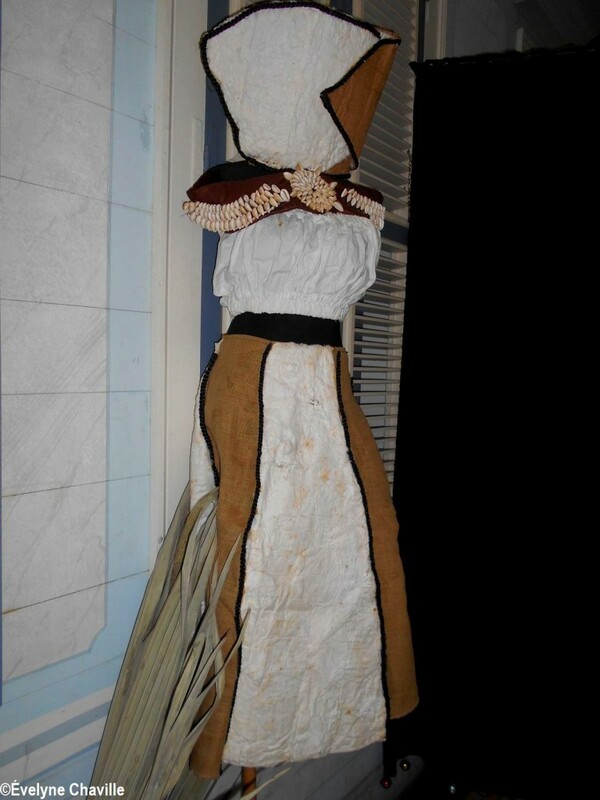 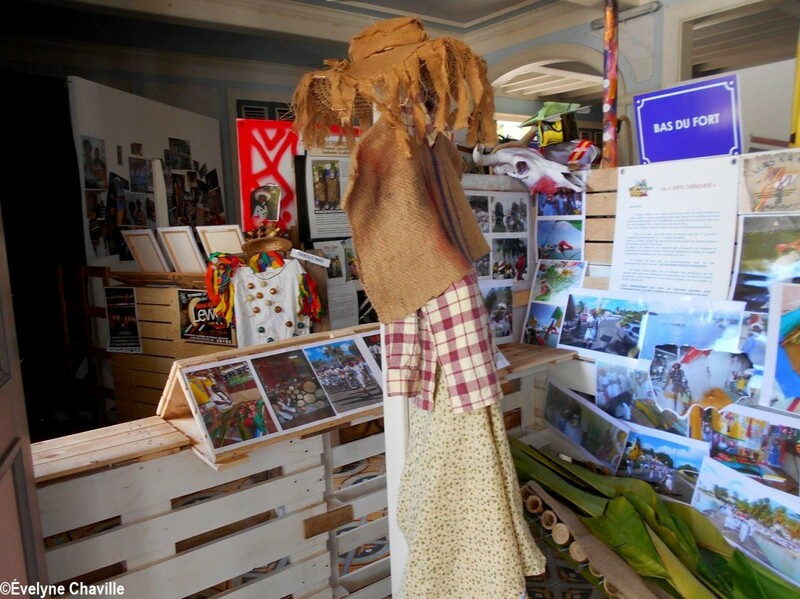 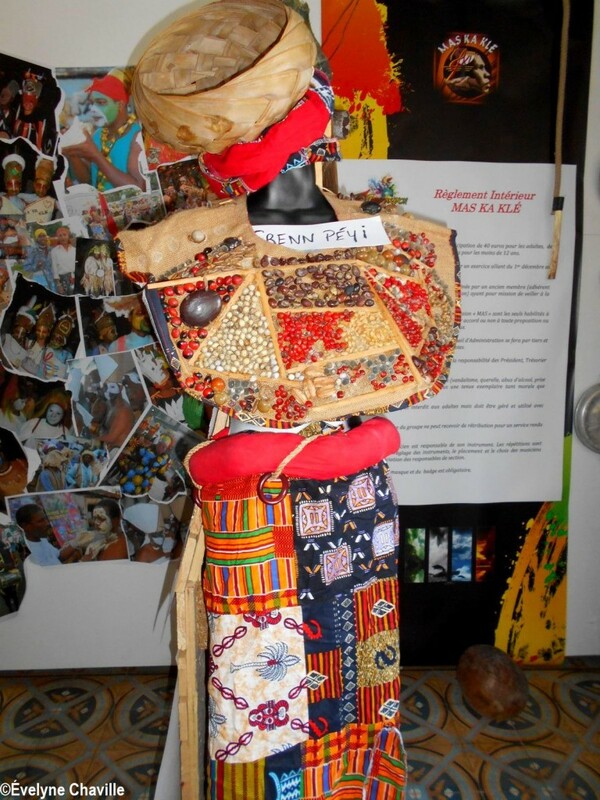 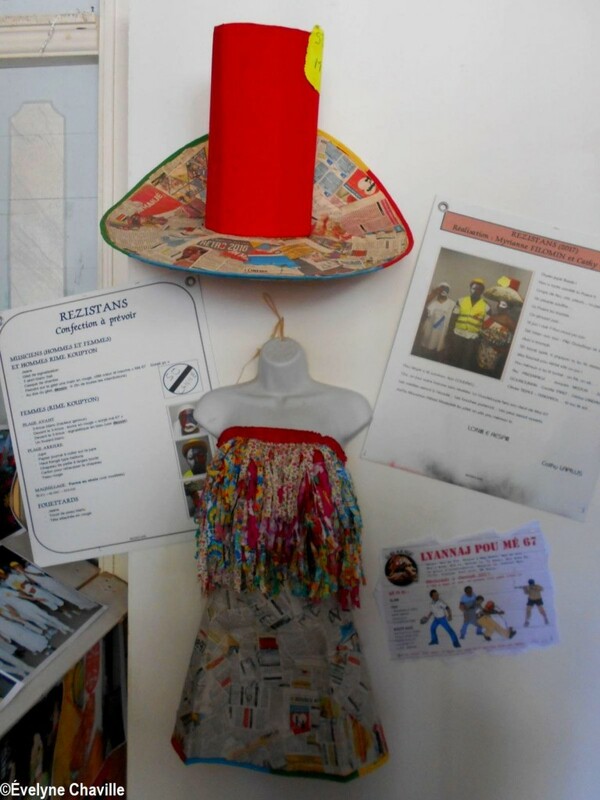 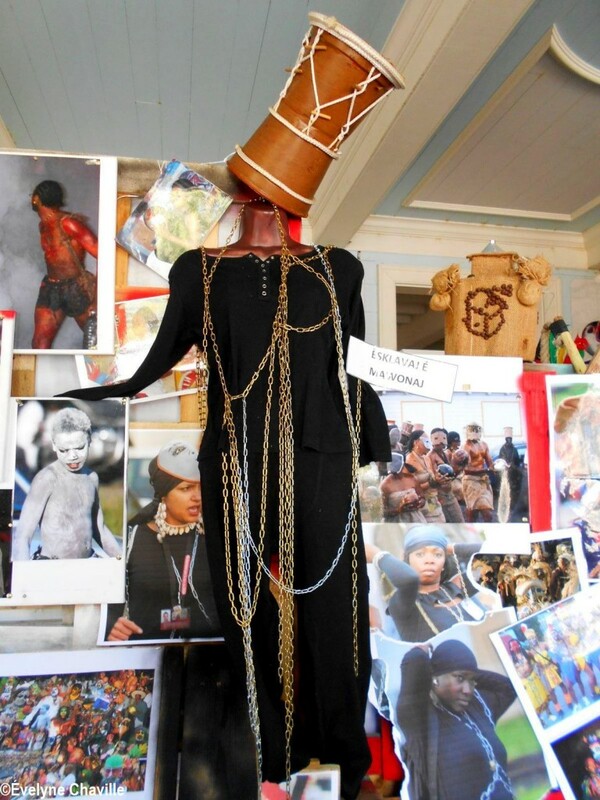 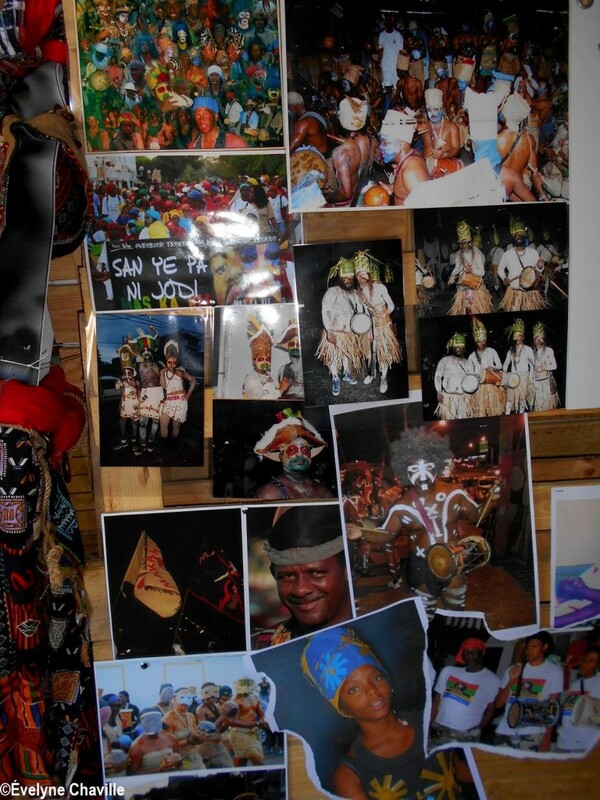 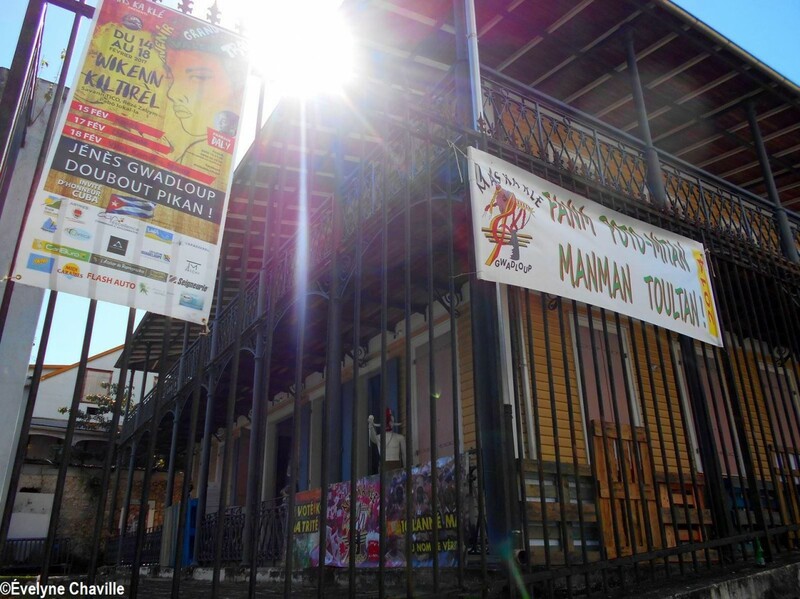 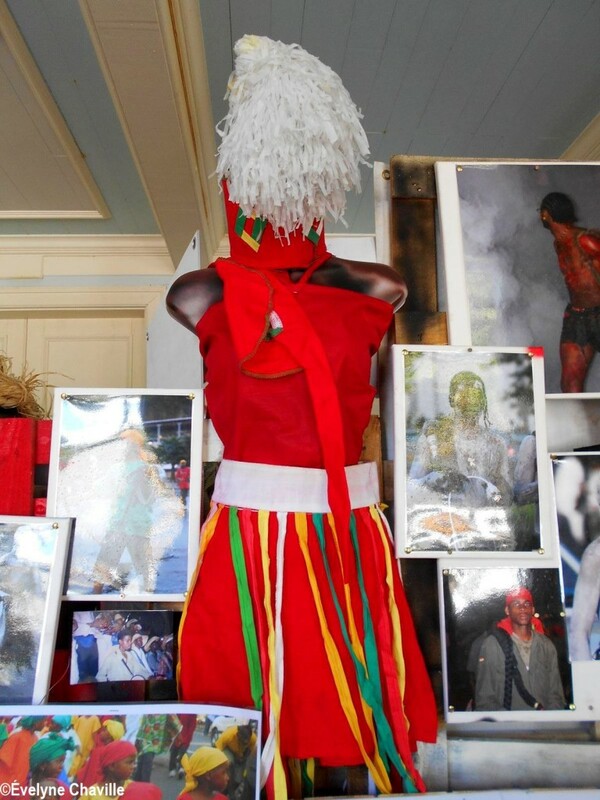 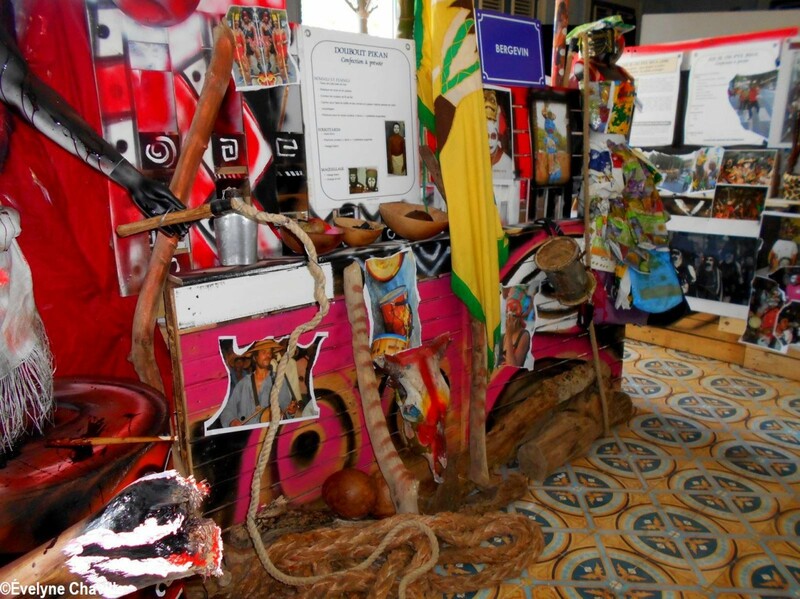 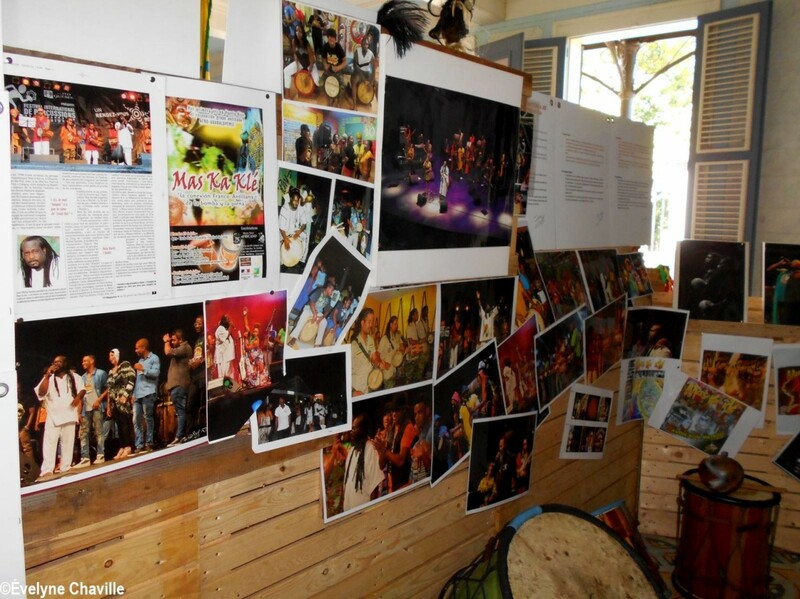 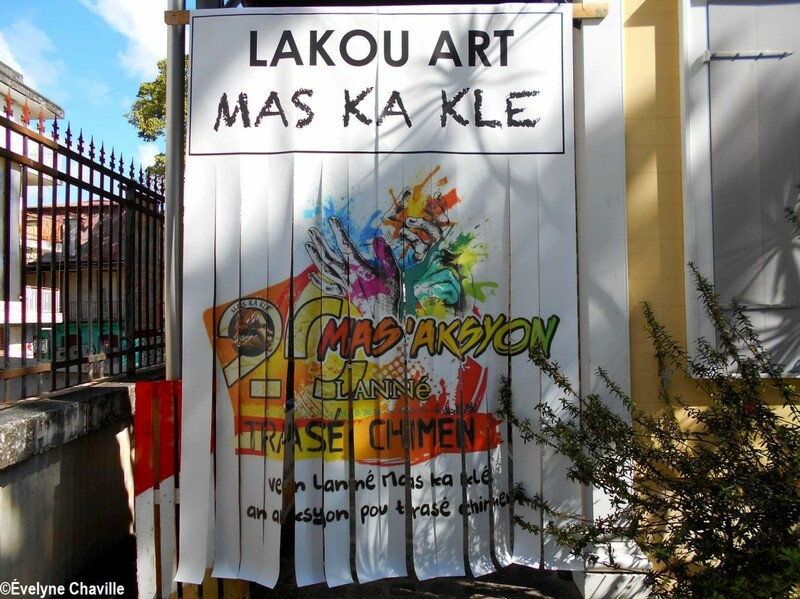 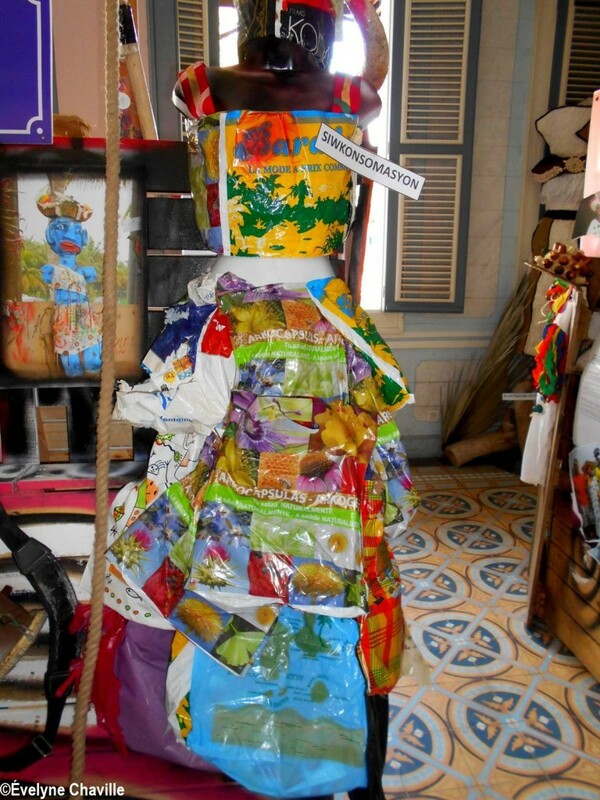 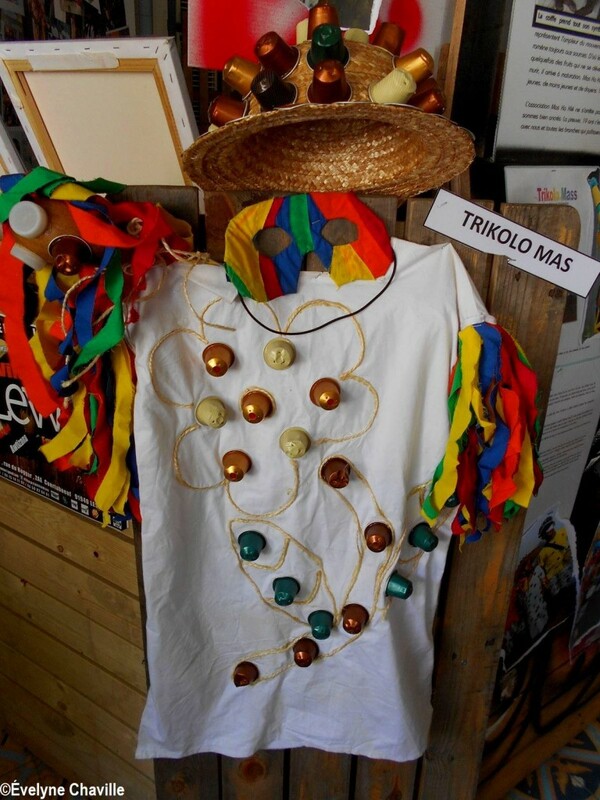 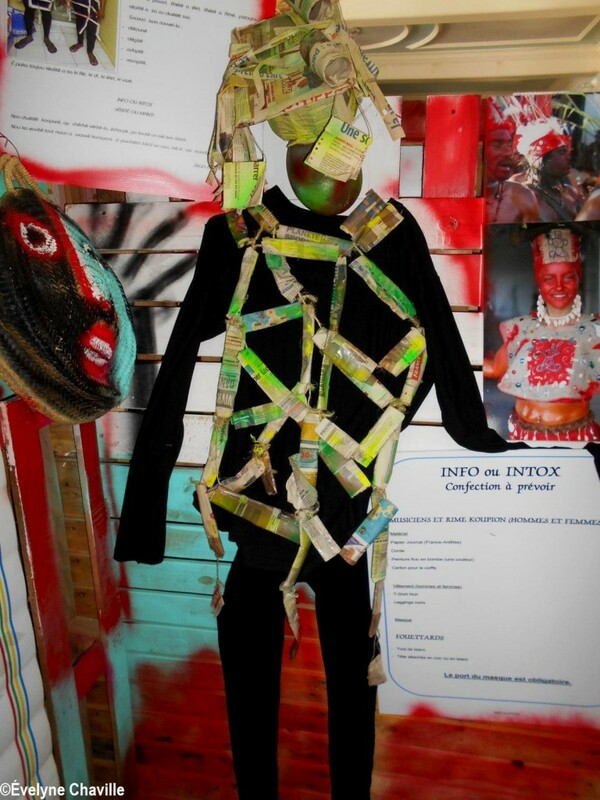 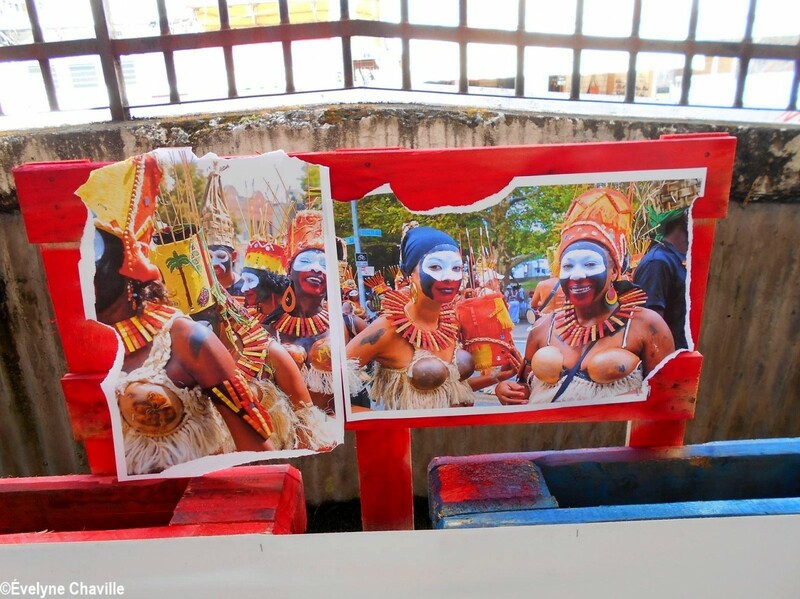 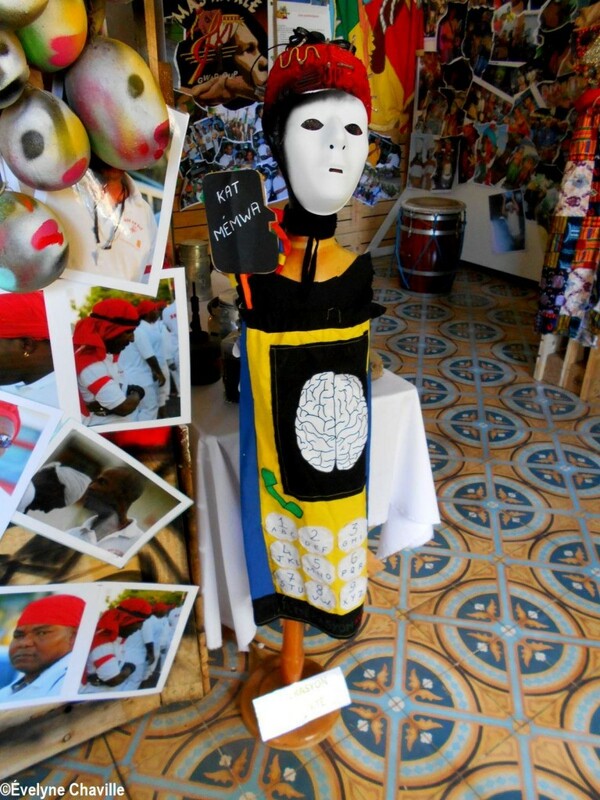 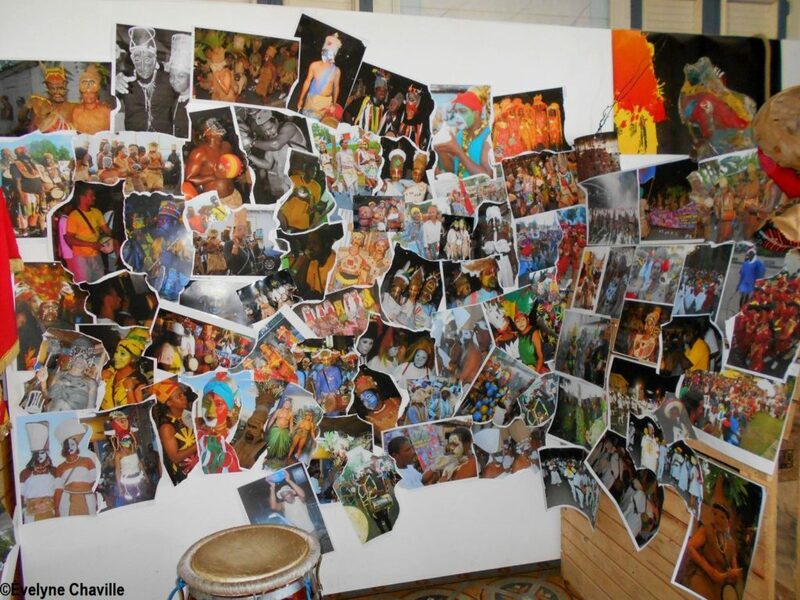 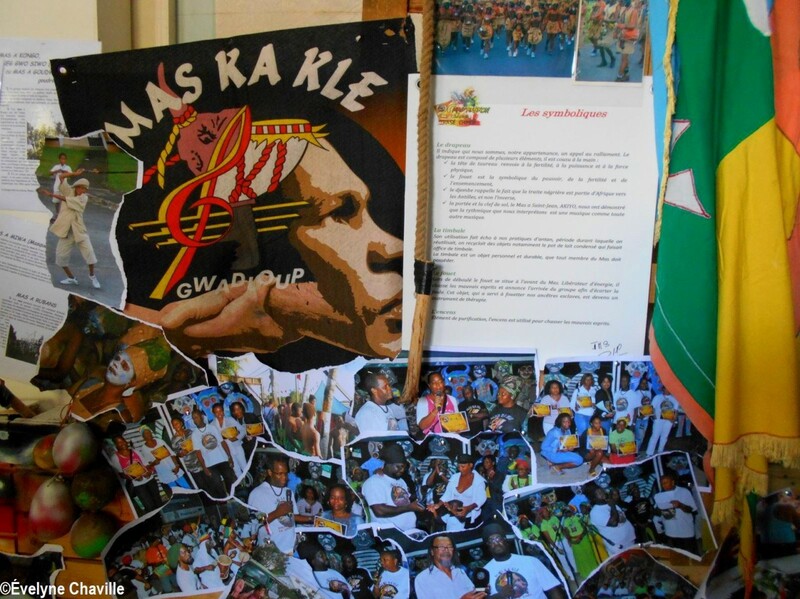 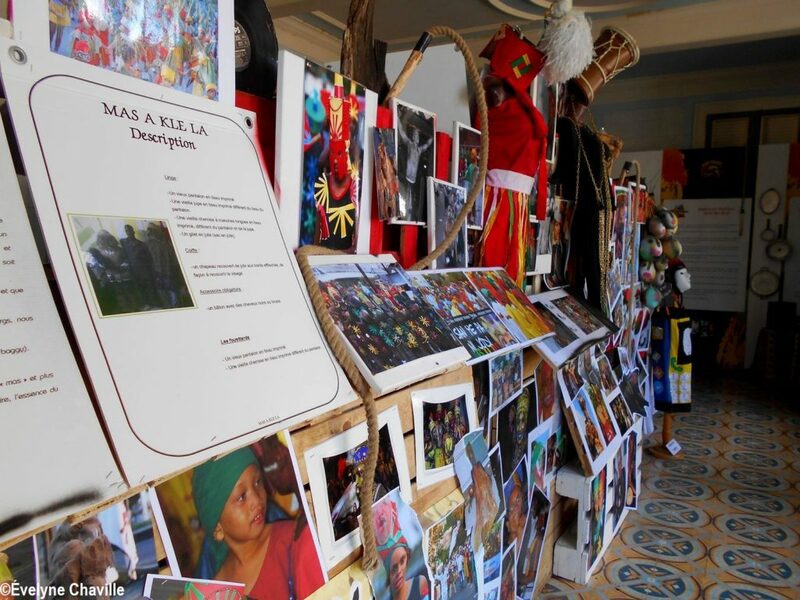 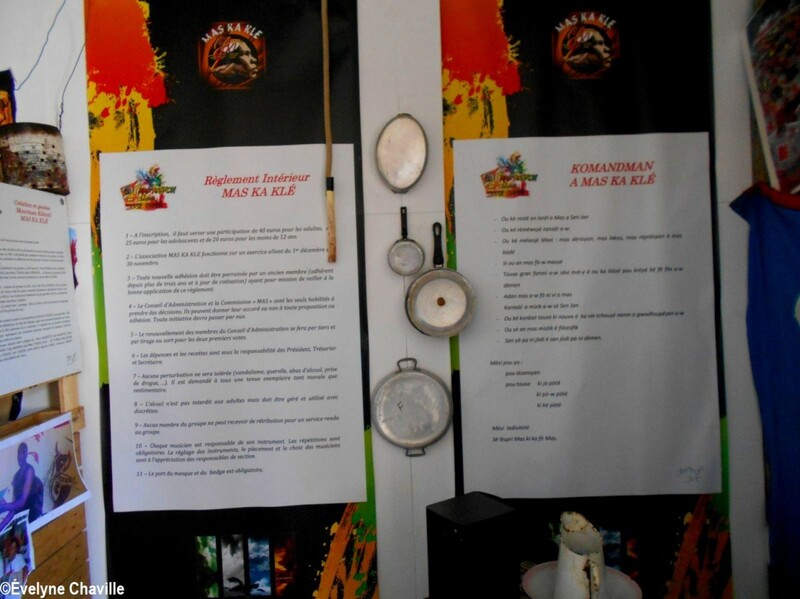 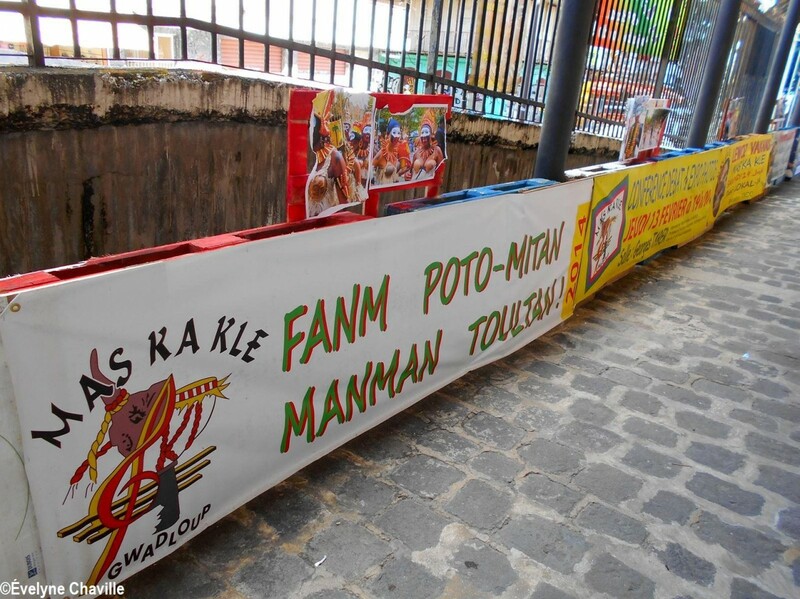 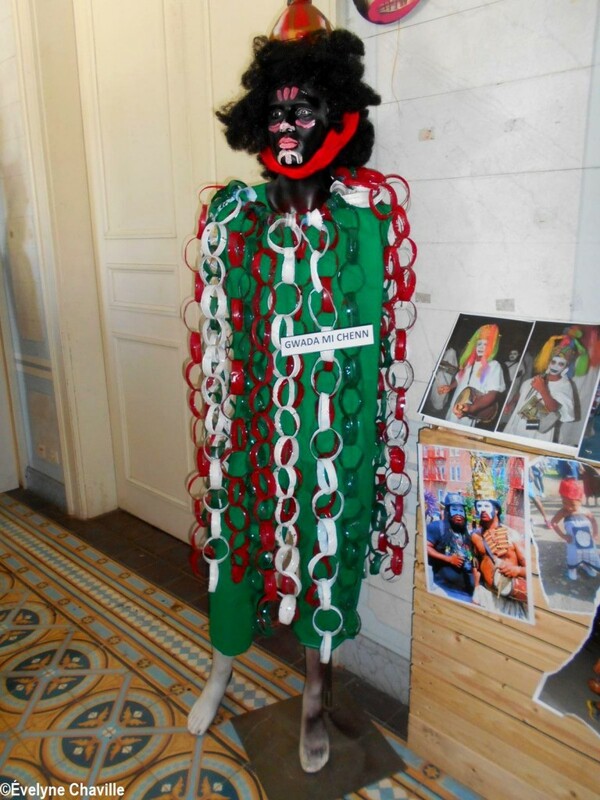 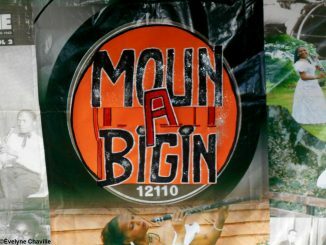 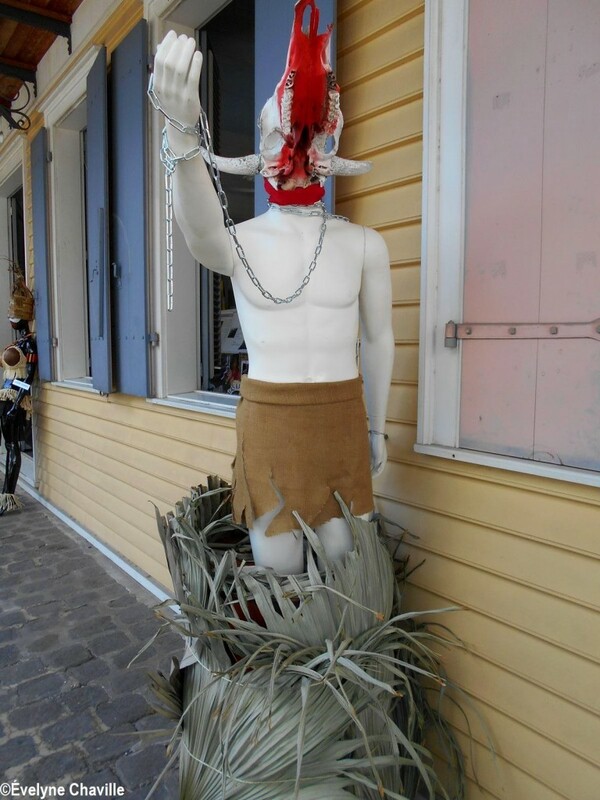 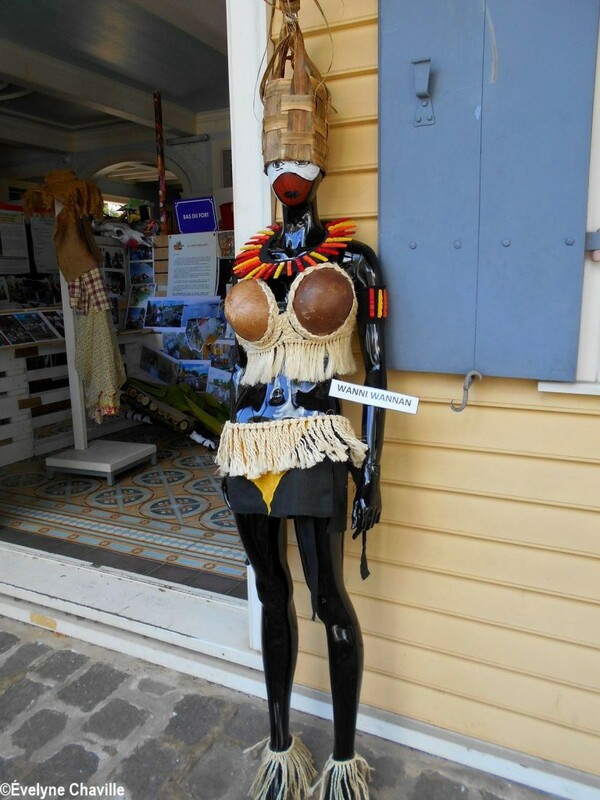 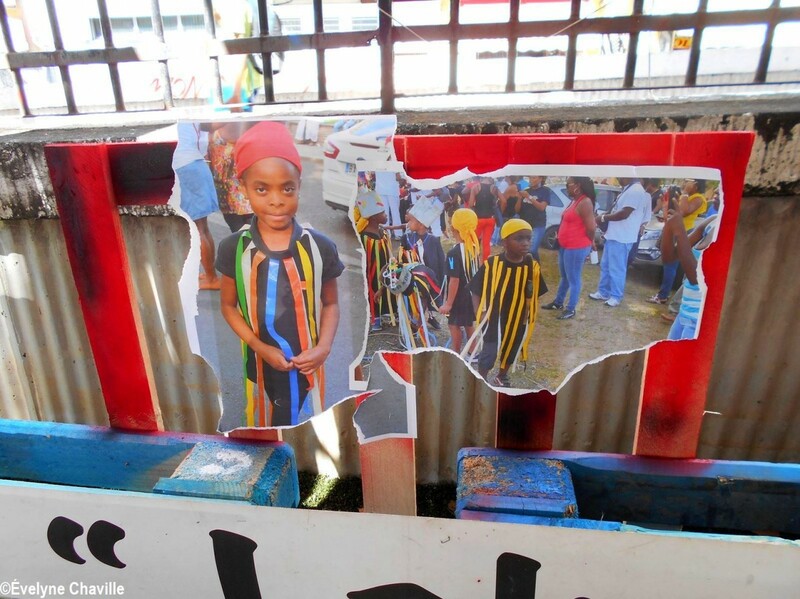 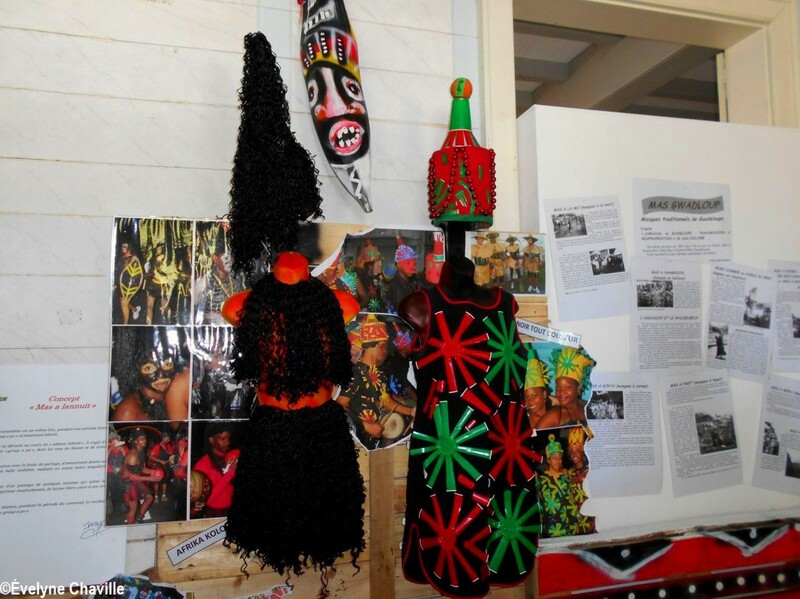 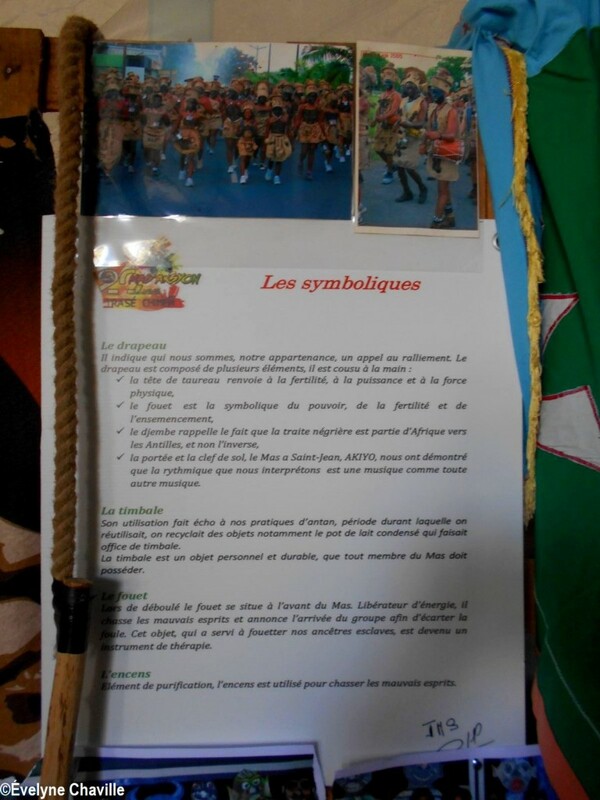 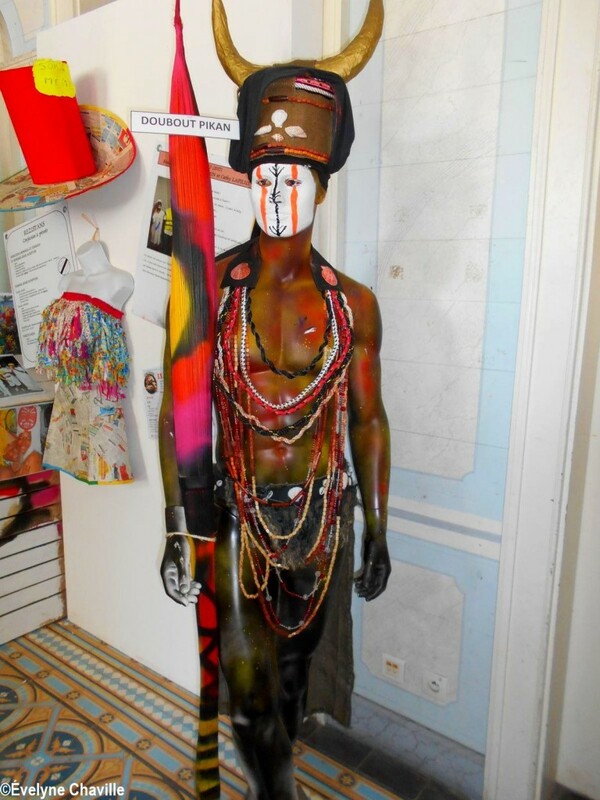 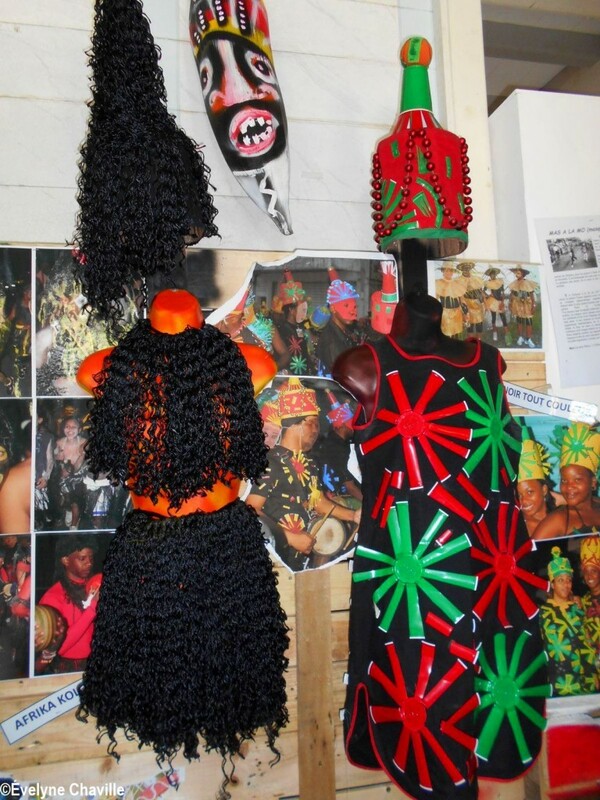 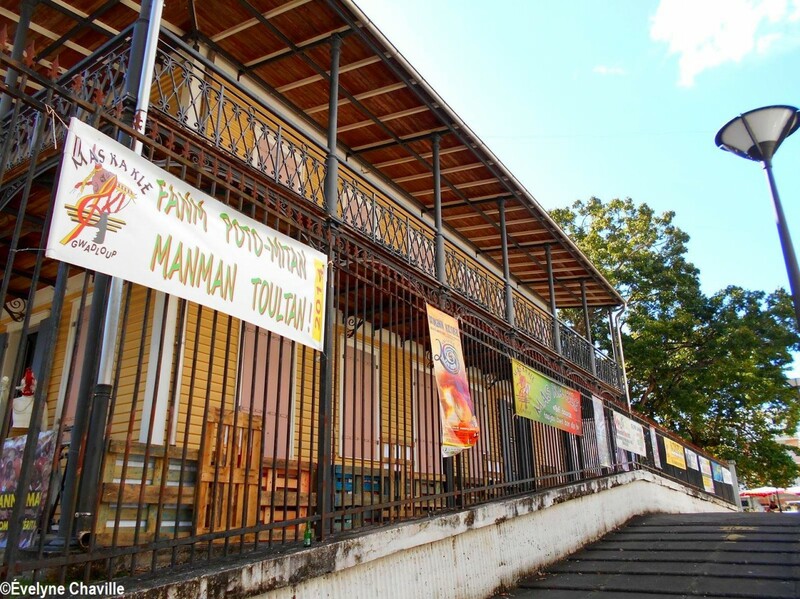 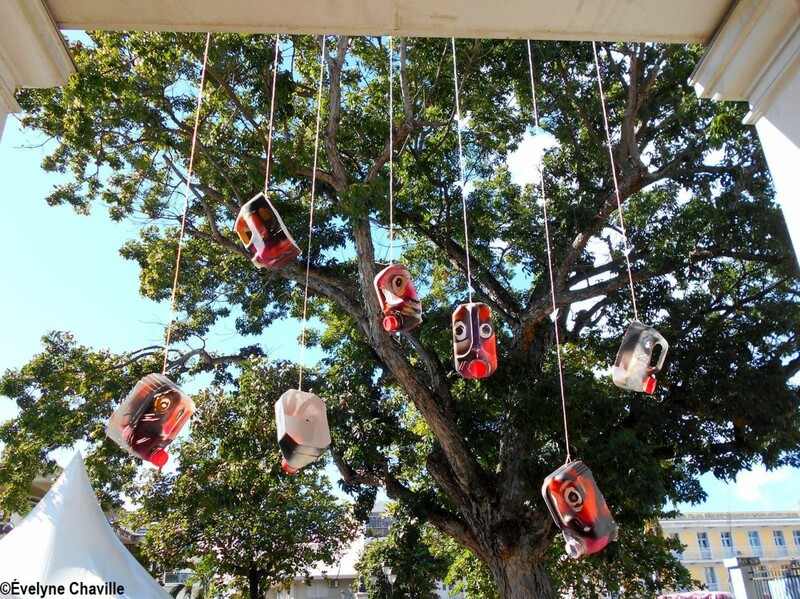 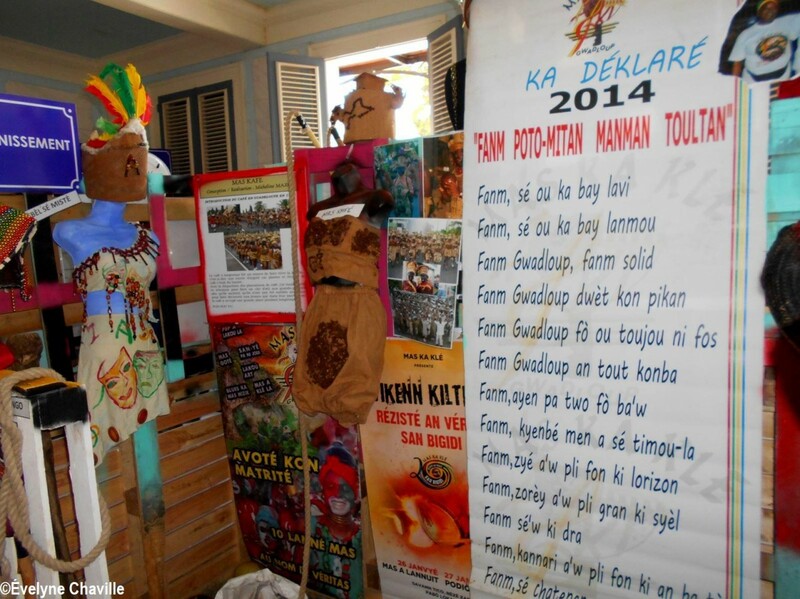 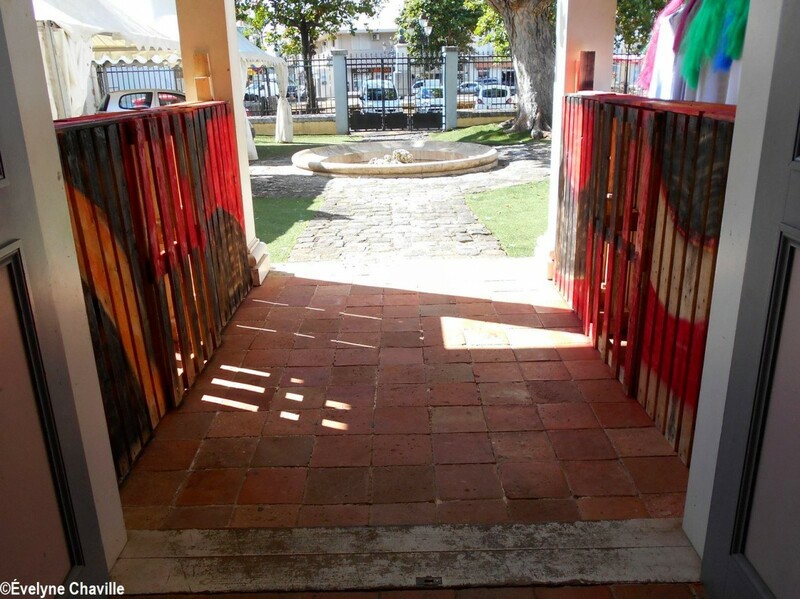 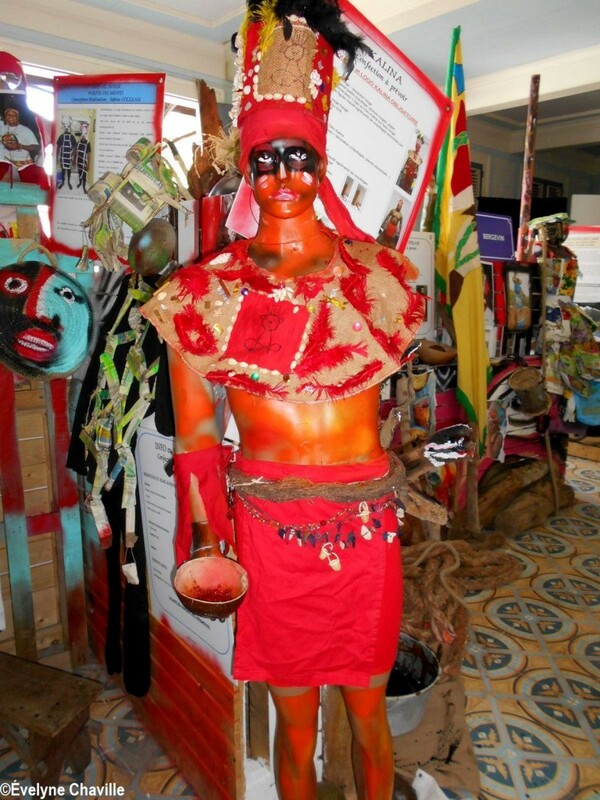 As part of its traditional “Wikenn Kiltirèl” which takes place from February 4 to 23, Mas Ka Klé, the well-known cultural association in the Guadeloupean carnival, organizes an exhibition entitled “20 lanné Mas’Aksyon, Trasé Chimen” at the Pavillon de la Ville in Pointe-à-Pitre (Guadeloupe). 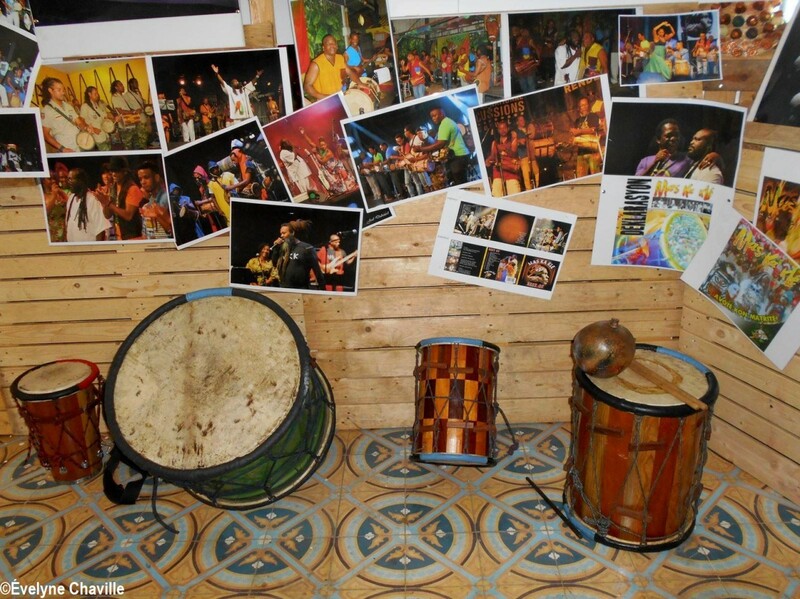 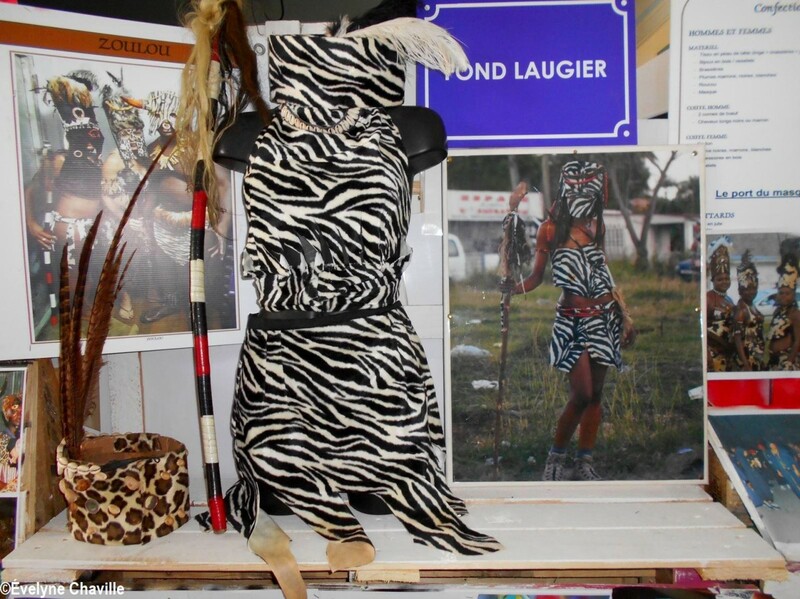 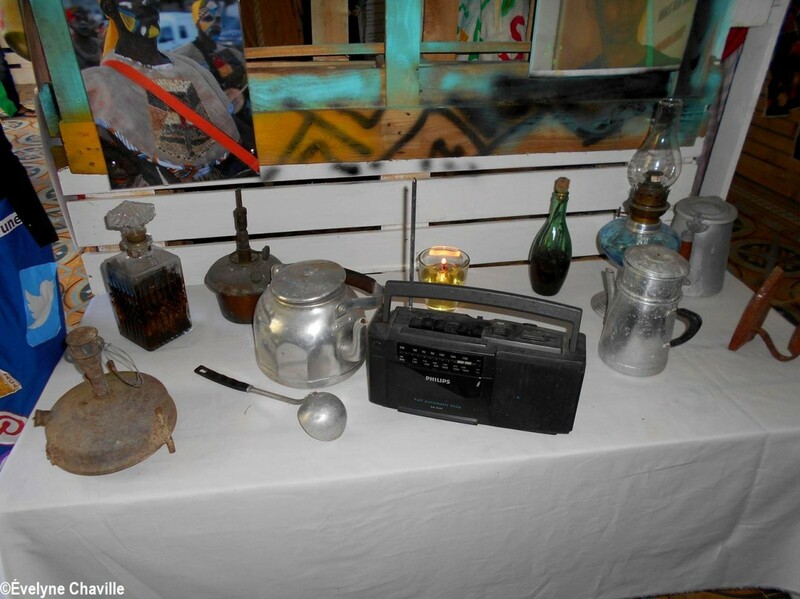 The scenography was made by the visual artist Joël Nankin according to his concept called “Lakou Art”. 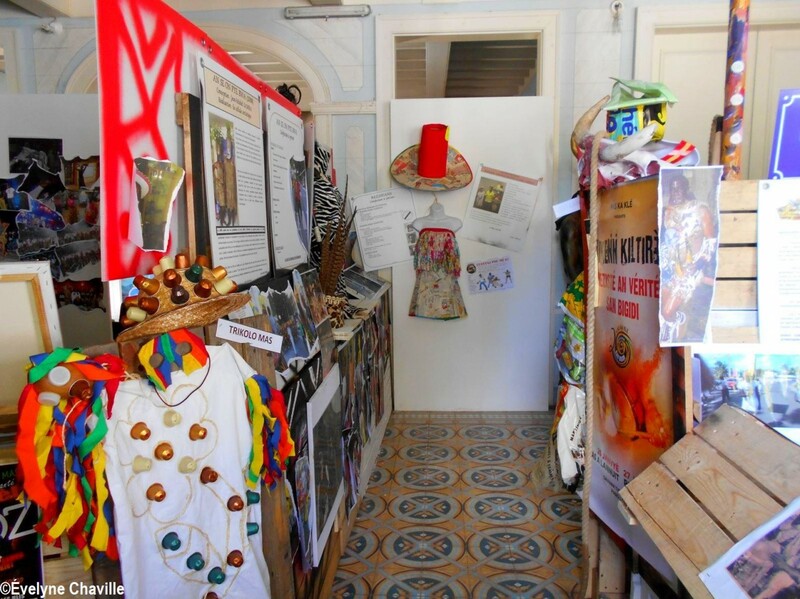 When the visitor arrives in front of the Pavillon de la Ville located on the Place de la Victoire, he sees that the cultural association Mas Ka Klé, took up residence there. 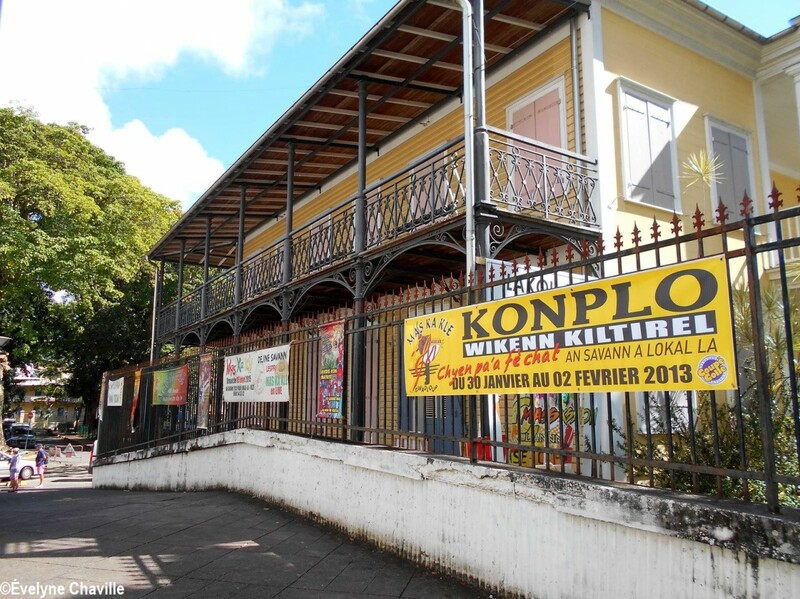 Several old banderoles of events organized over the last few years are tied to the outer railings. 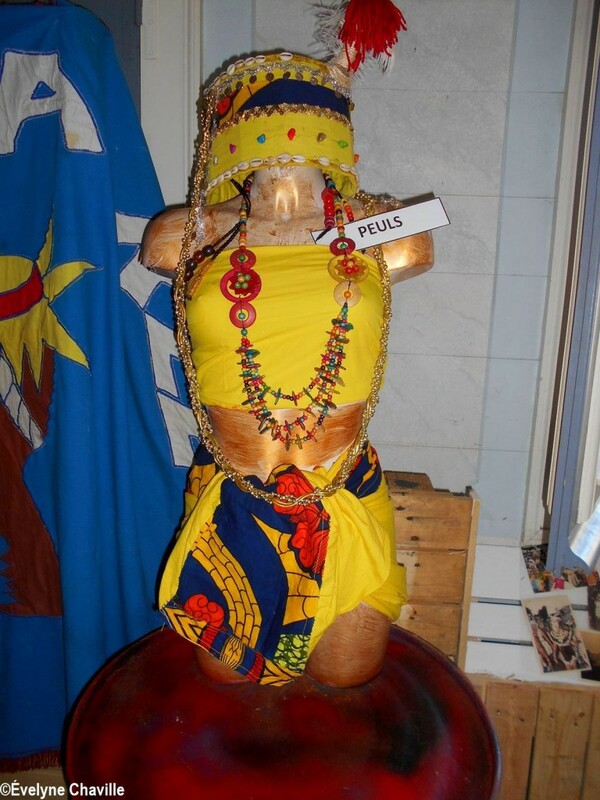 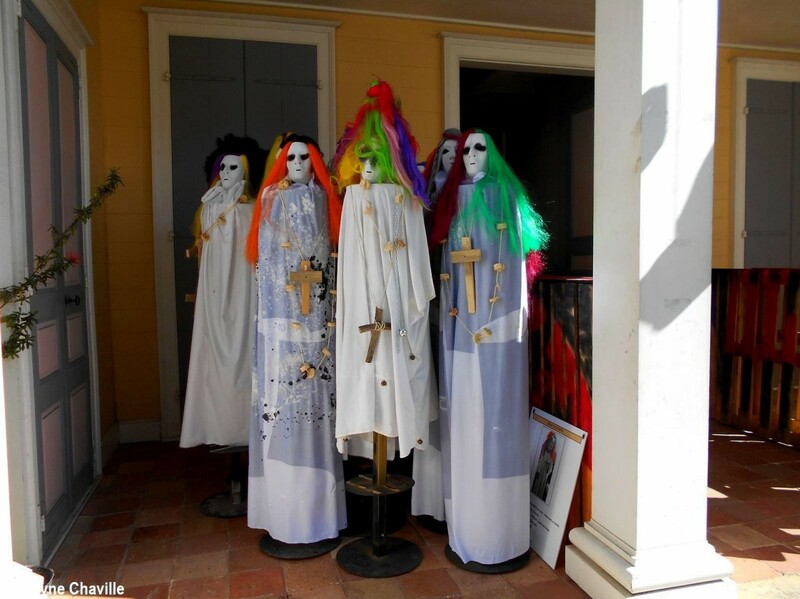 In front of the building, there are models with white or light blue dresses, fluorescent colored wigs and a wooden cross round their necks: these are “Mas a Lespri”. 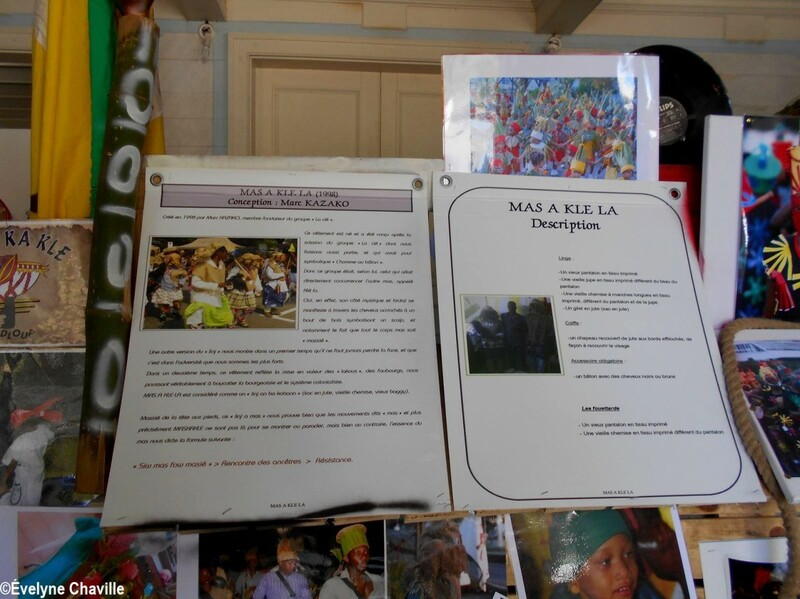 A sign “Si tras a mas la” shows him the beginning of the exhibition. 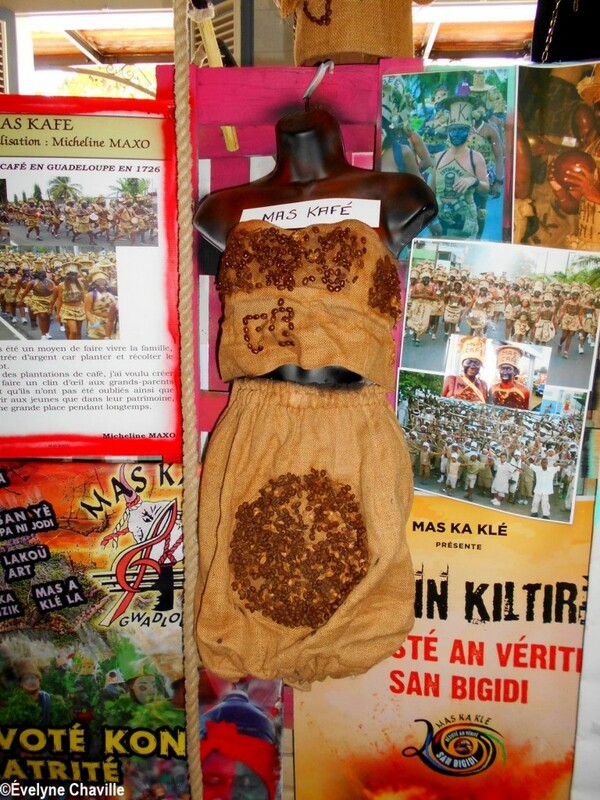 So, he goes through a curtain which shows him that he enters the Mas Ka Klé “lakou” (Creole word that means courtyard, in English). 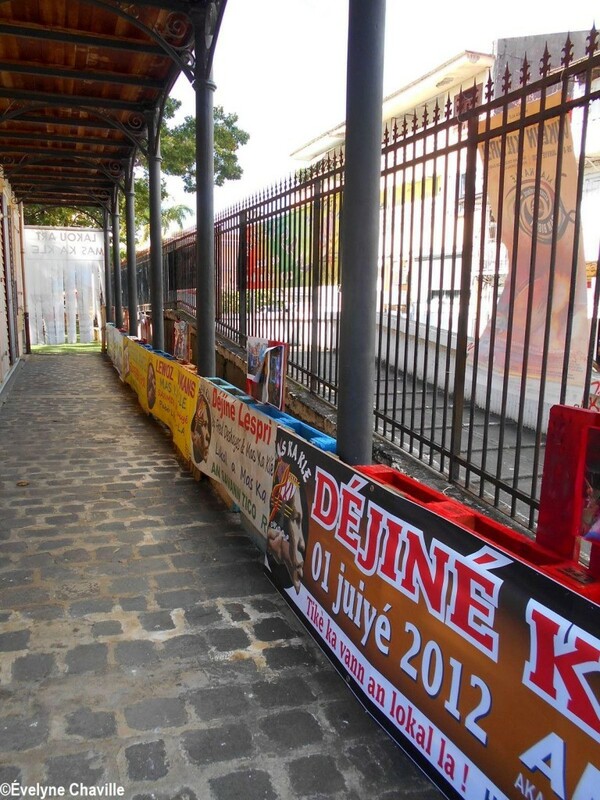 Other old banners are also arranged along the “corridor” as well as some photos. 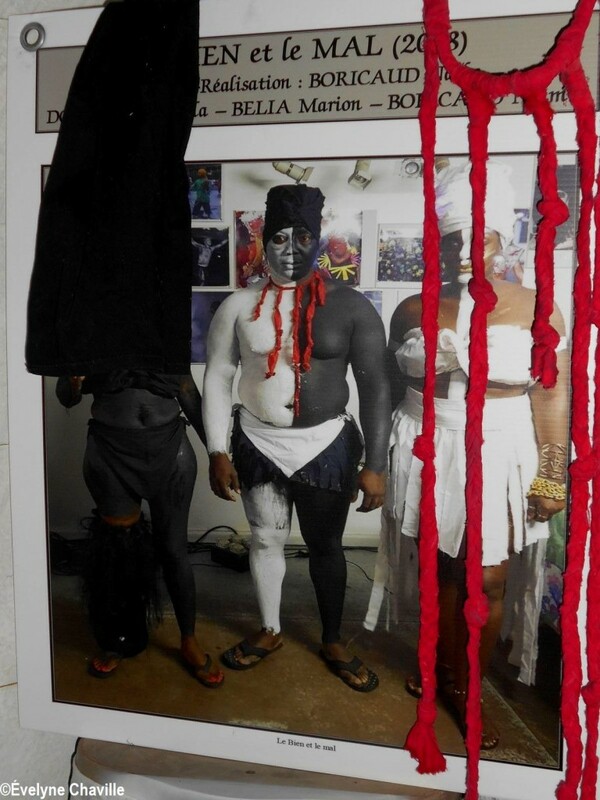 He is welcomed by the centaur then two models, one wears the “Wanni Wannan” costume, and an explanatory poster on the concept of “Lakou Art”; he reads that the “lakou” is “a historic place where escaped slaves took refuge in times past (…) in this mythical place, our “Saint-Jean” music was created (…) Mutual aid, sharing and solidarity were of prime importance, not forgetting envy and betrayal (…) the education of children was done by parents as well as by neighbours (…) meetings and exchanges were appropriate not to mention artistic traditions such as games, dance, music and culinary traditions (…) “. 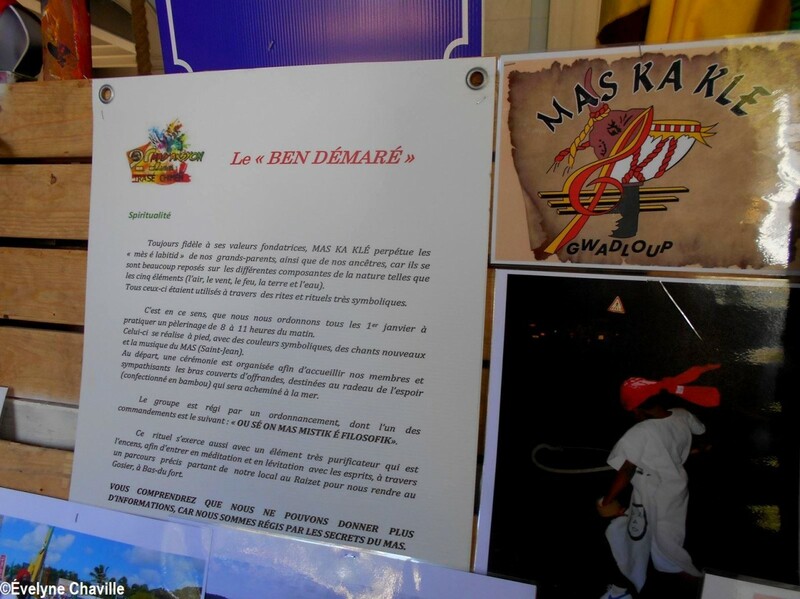 Once inside the room, the visitor is immediately immersed in the “Mas” atmosphere according to the Mas Ka Klé group.Symbolically, there are several names of districts of Les Abymes and Pointe-à-Pitre conurbation in the exhibition such as “Assainissement”, “Bergevin”, “Savann Tico”, “Fond Laugier”, places where the parades pass. 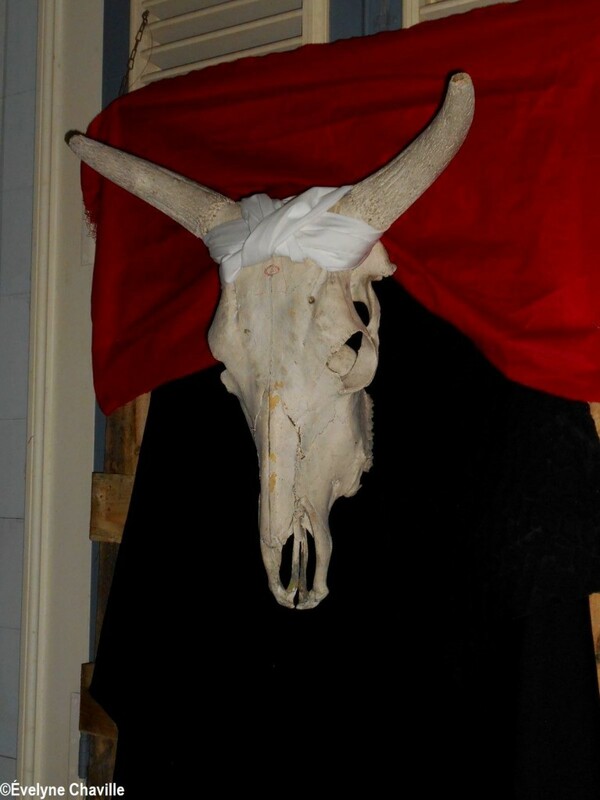 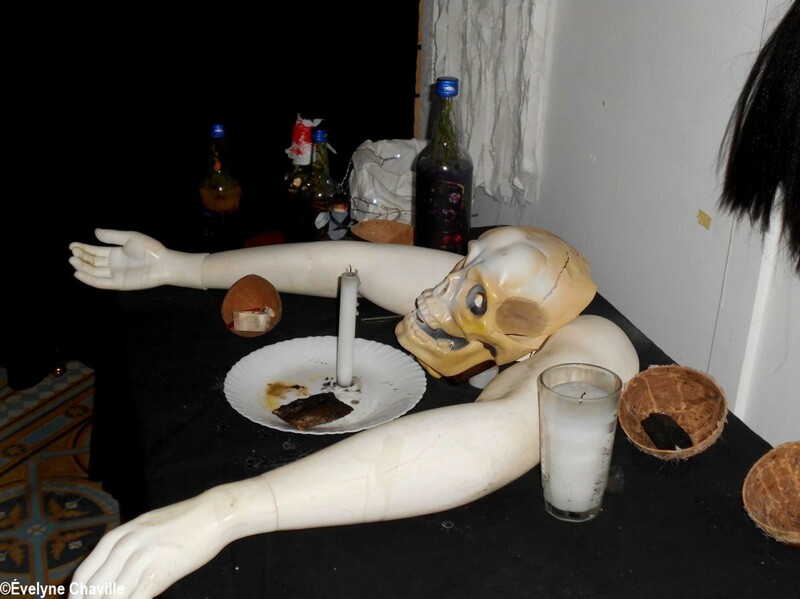 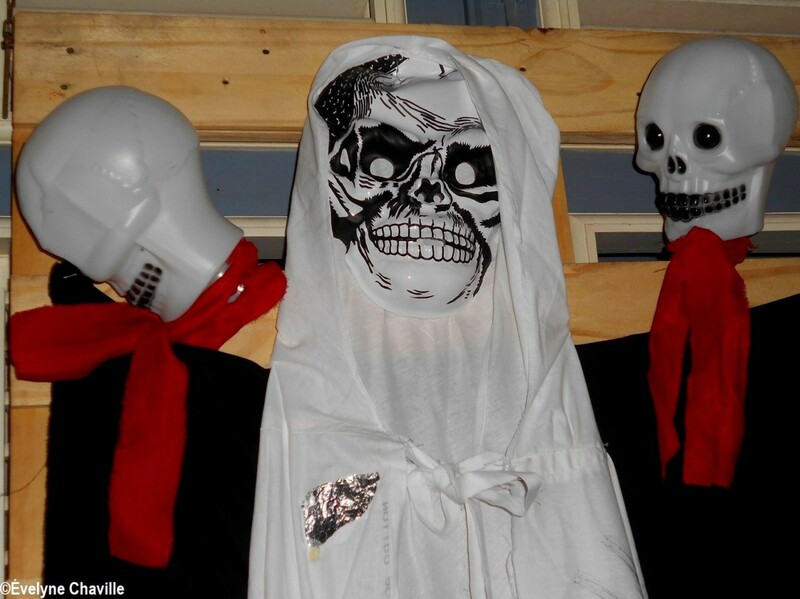 When he continues the tour, the visitor goes through a black curtain : he enters a dark part dedicated to the “gadèd zafè” (clairvoyant-witch) with a white candle in a white plate, an longhorn skull, skulls, herbs in bottles, an incense smell… After, the visitor arrives in a brighter space – the market – with drums and many photos of concerts given by Mas Ka Klé. 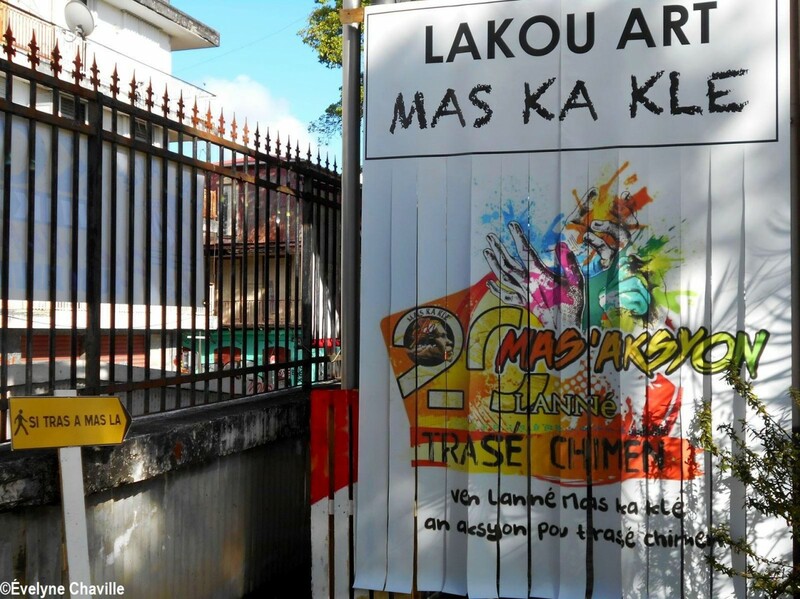 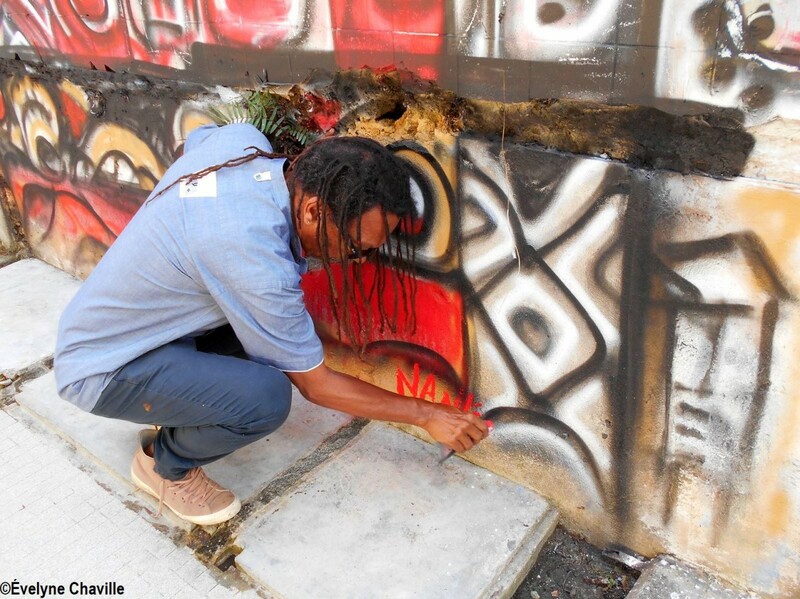 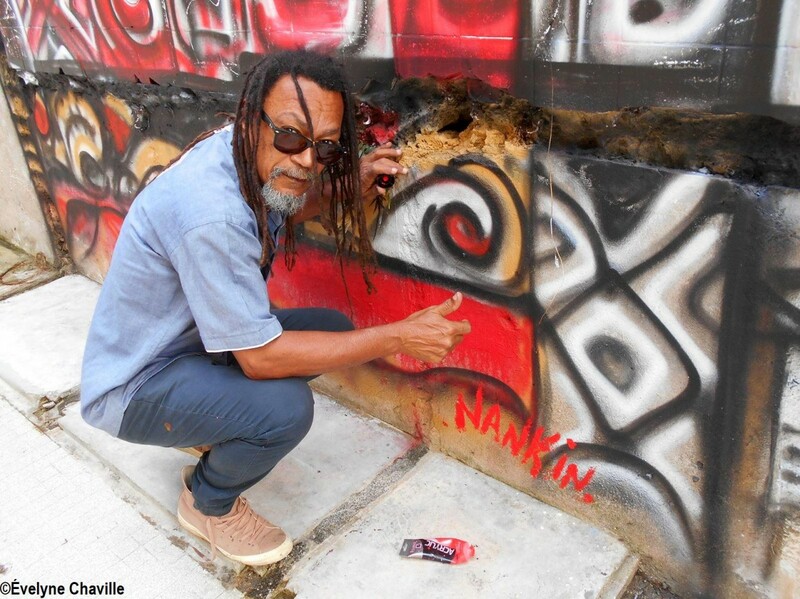 Joël Nankin is the scenographer of the exhibition entitled “20 lanné Mas’Aksyon, Trasé Chimen” that was designed according to the “Lakou Art” concept which was imagined by the famous Guadeloupean plastic artist. 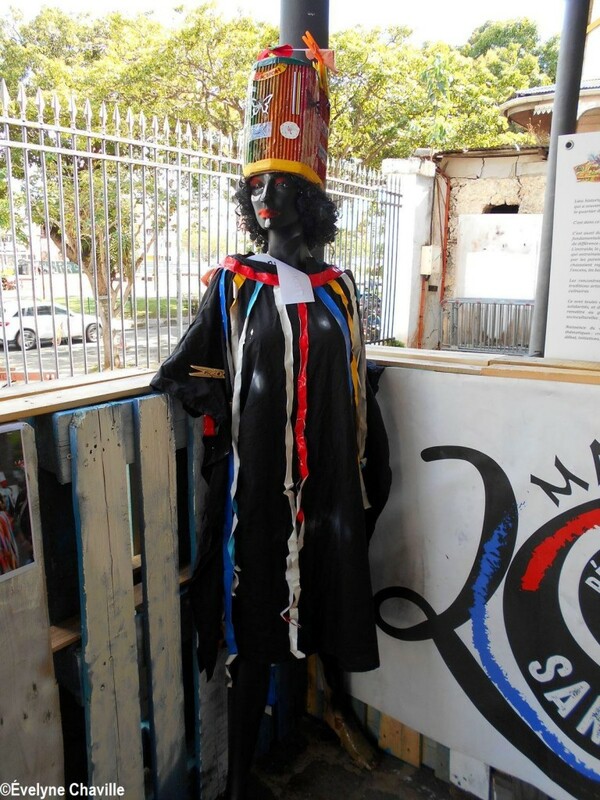 “I had already worked on this concept in my exhibitions and, one day, Jean-Michel Samba, the president of Mas Ka Klé, who also thought about this theme, asked me to collaborate with his association. 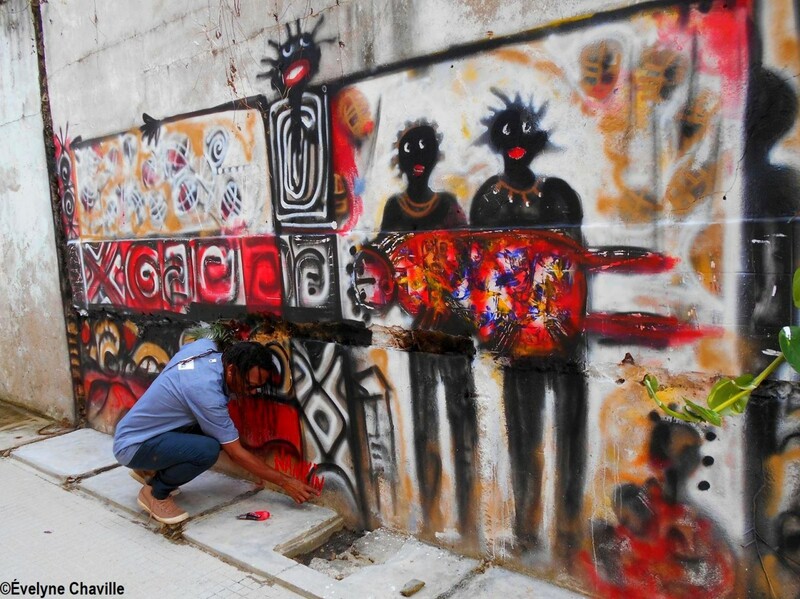 Before this exhibition, I already had the opportunity to work with Mas Ka Klé on the “Lakou Art” concept”, he said. 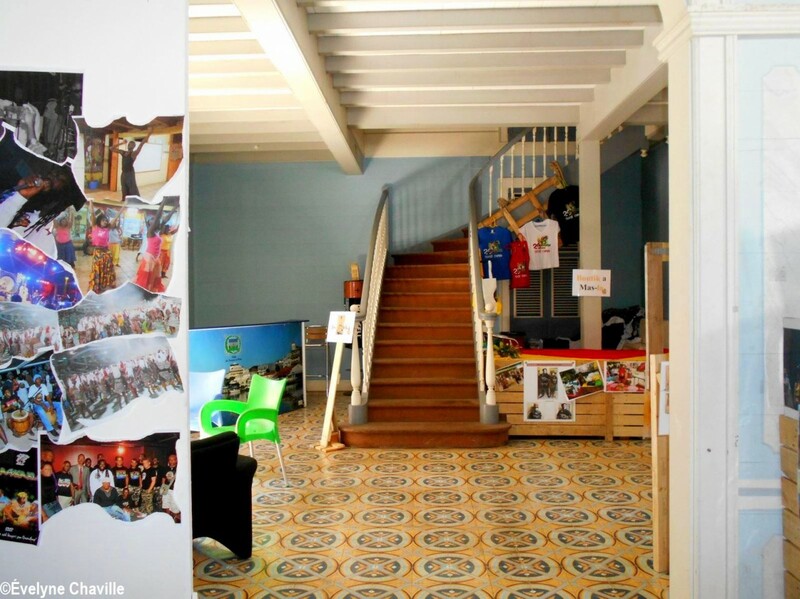 However, one of the difficulties was the impossibility of using drawing pins or nails, to fix things on the walls since the Pavillon de la Ville is a listed building. 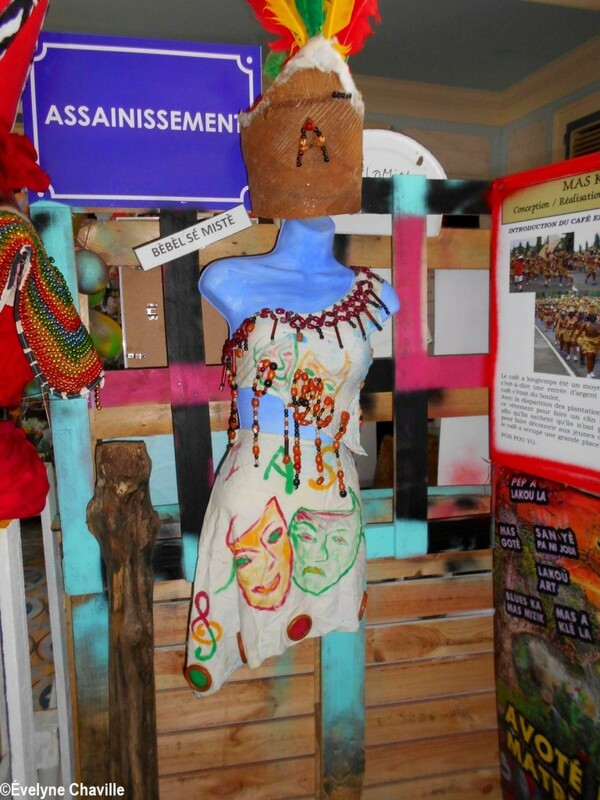 To do it, the artist used pallets, a lot of pallets that were salvaged on the port of Jarry : “I cannot say exactly how many pallets are in this exhibition but I know that I carried a lot”, he said. 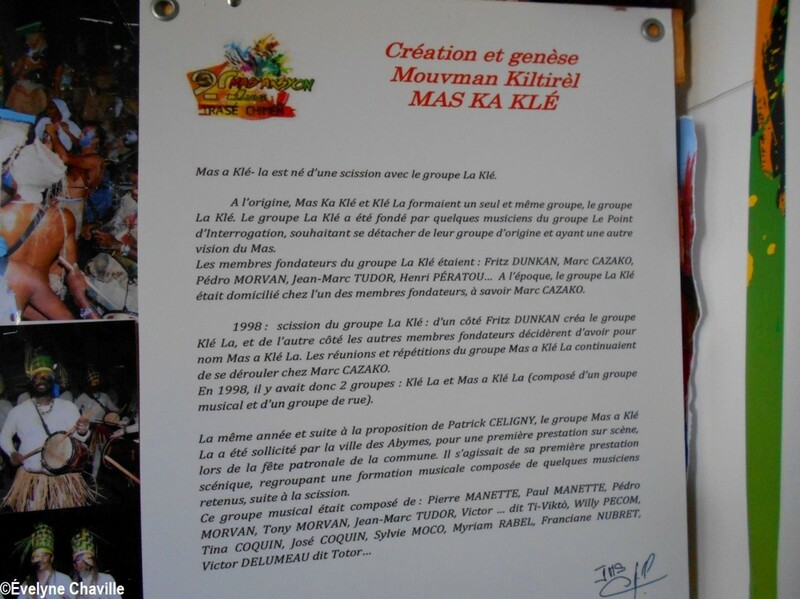 In total, a team of six people, Joël Nankin and five members of the association Mas Ka Klé, worked for five days and until 2:00 am on Monday, February 4, so that everything is ready since the private view took place the same day at 7:30 pm. 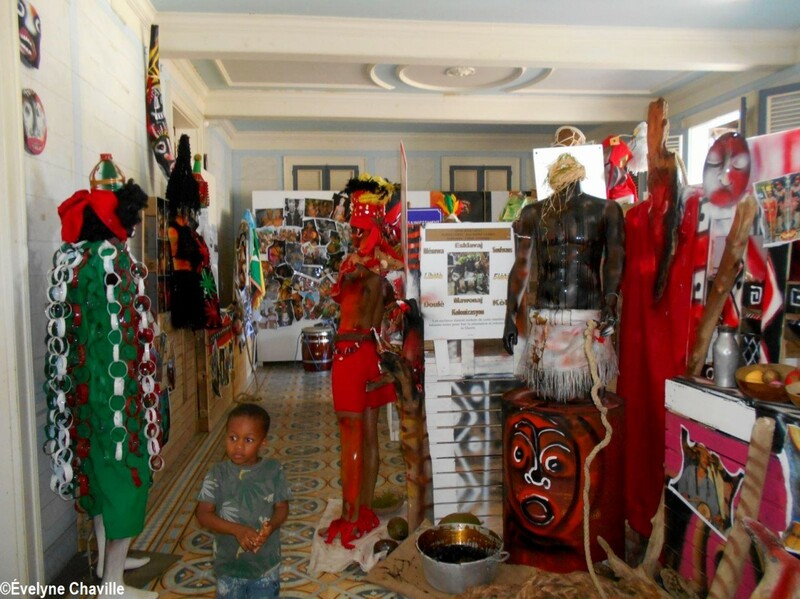 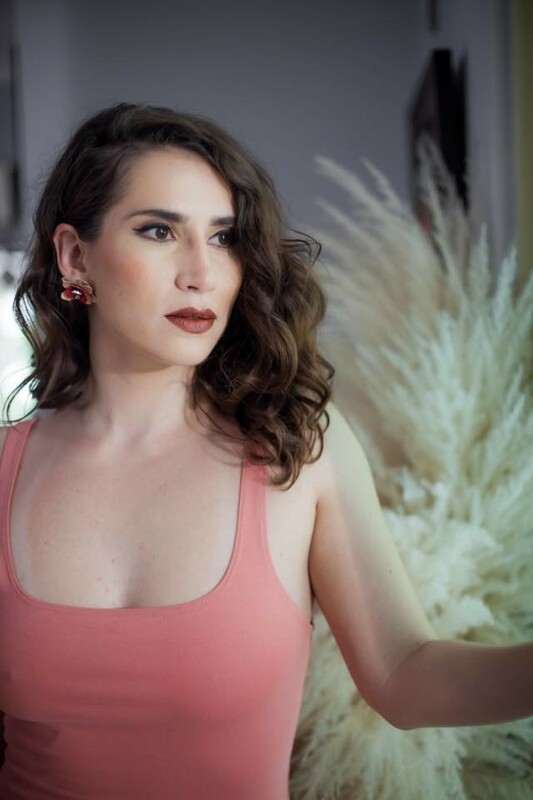 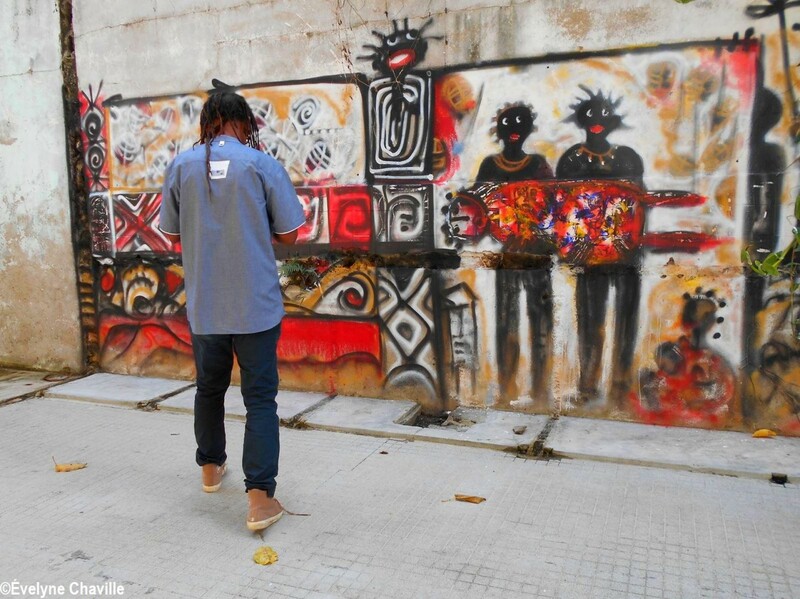 “People do not go directly into the showroom, they pass a door and they must follow a path to reach the “lakou”, said the artist. 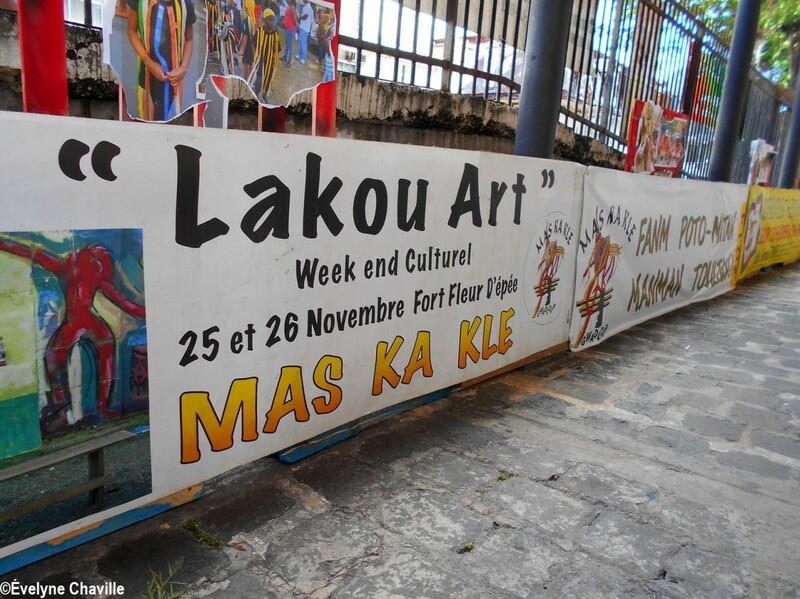 “When I was young, there were “lakou“, they were often several huts, and in the middle, generally, was this courtyard. 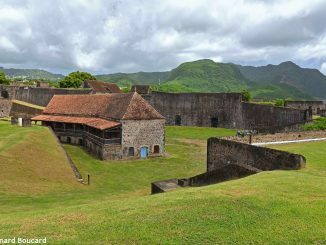 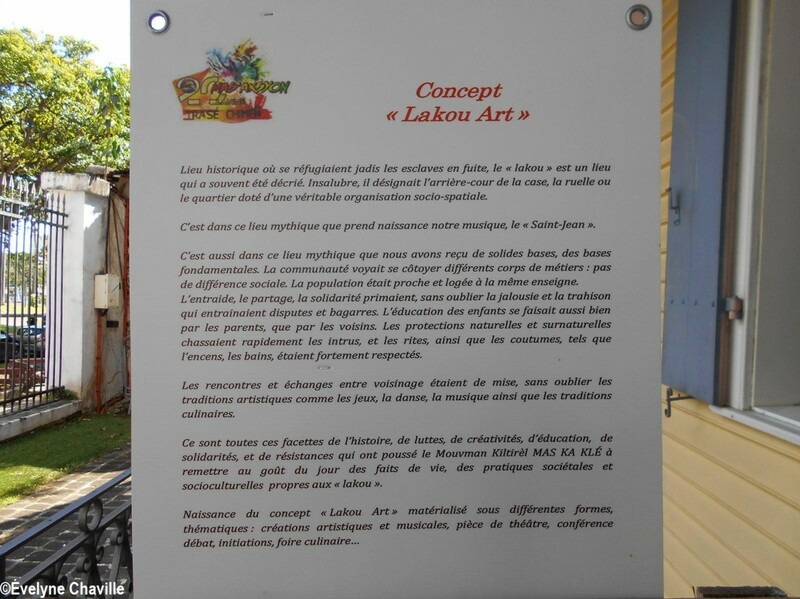 Around Pointe-à-Pitre, for example, there were several “lakou” that often have the name of the first person who settled there like “Lakou Mombruno”, “Lakou Raspail” etc. 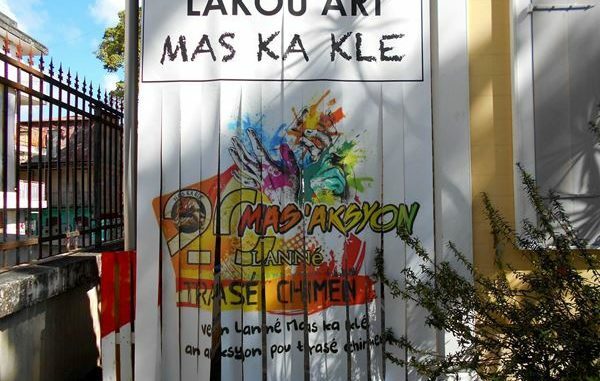 It is surely in this space, the “lakou”, where were invented the rice and red beans, rice and lentils for example, in short, the idea of mixing these ingredients while in the countries they come from people do not mix them… That is also the popular genius (…) There are also “Lakou” in Haiti”, he continued. 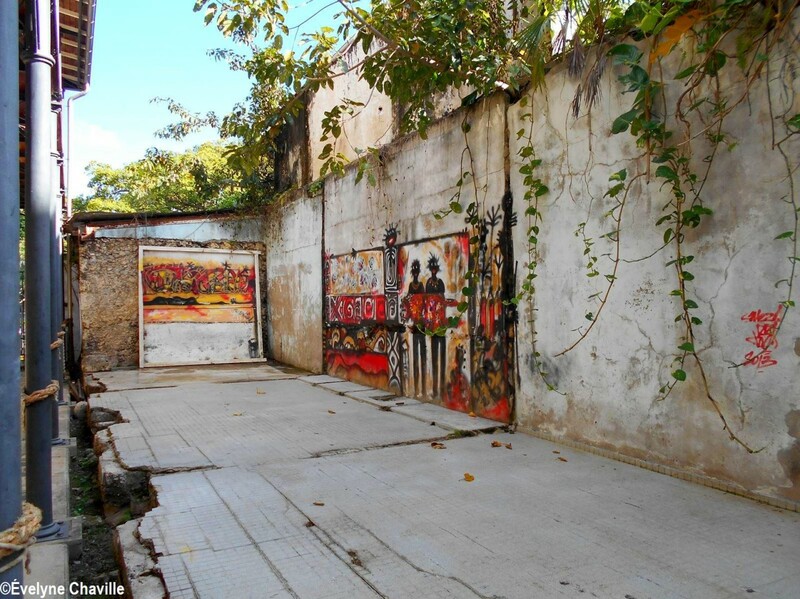 About the large number of pictures, the scenograph draw his inspiration from the pages of newspapers that covered the walls of these little houses : “some of them are torn as was sometimes the case and this create a kind of patchwork”, he said. 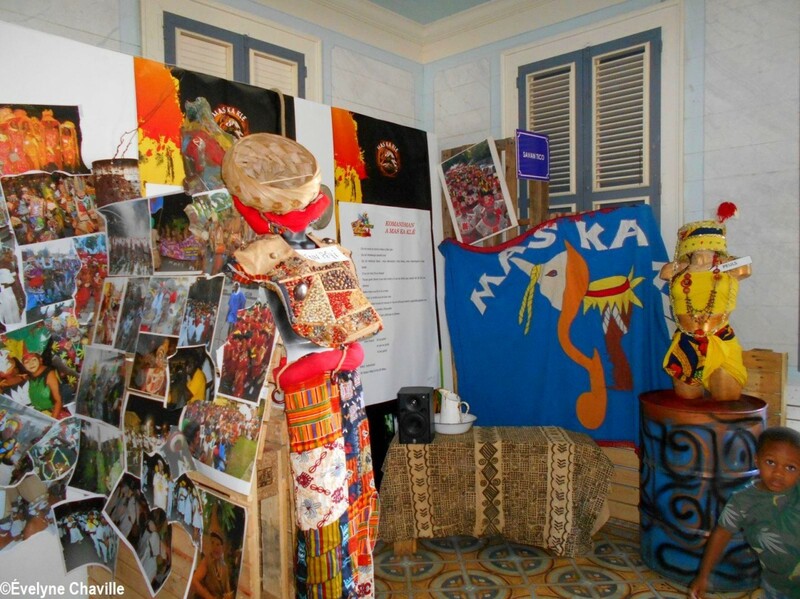 Many guests were present at the opening of the exhibition and the celebration of the 20th anniversary of Mas Ka Klé. 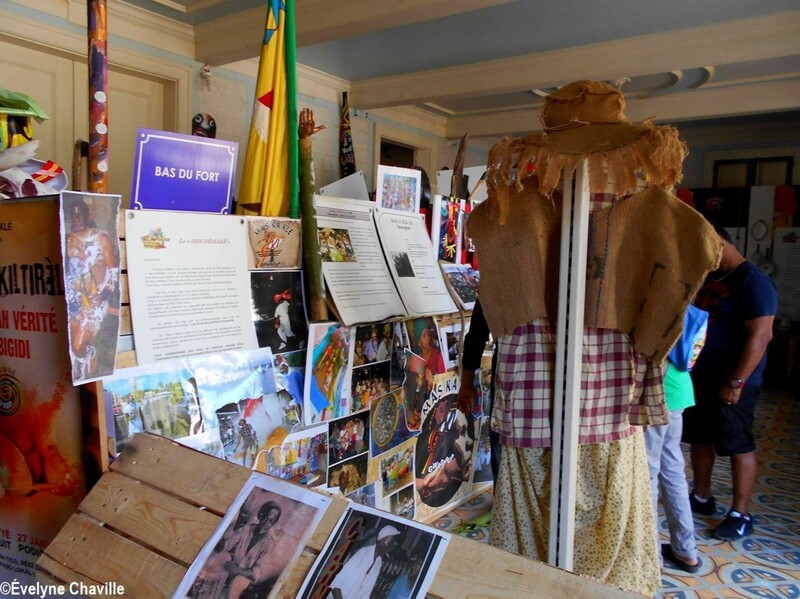 If the elders who certainly knew the “lakou” watched with great interest the staging by Joël Nankin, schoolchildren who will visit this exhibition will discover aspects of the Guadeloupean society they do not know. 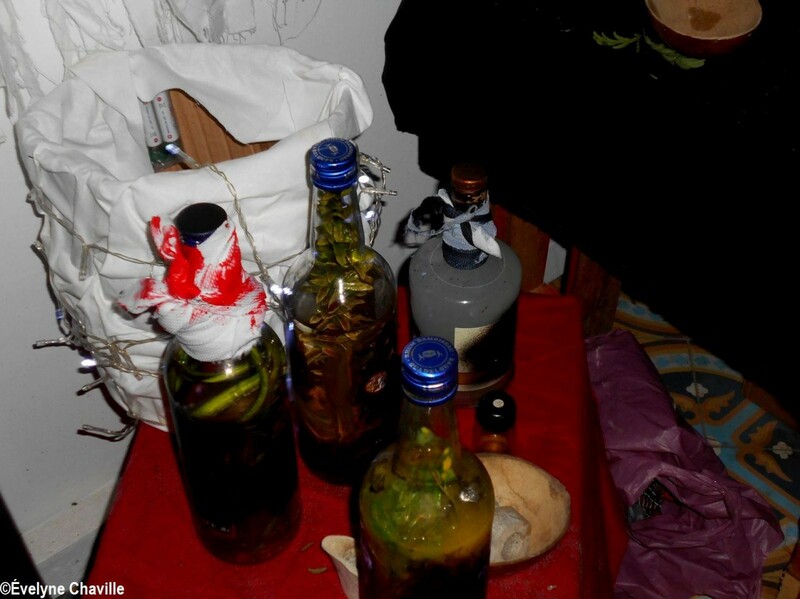 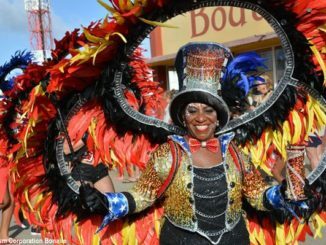 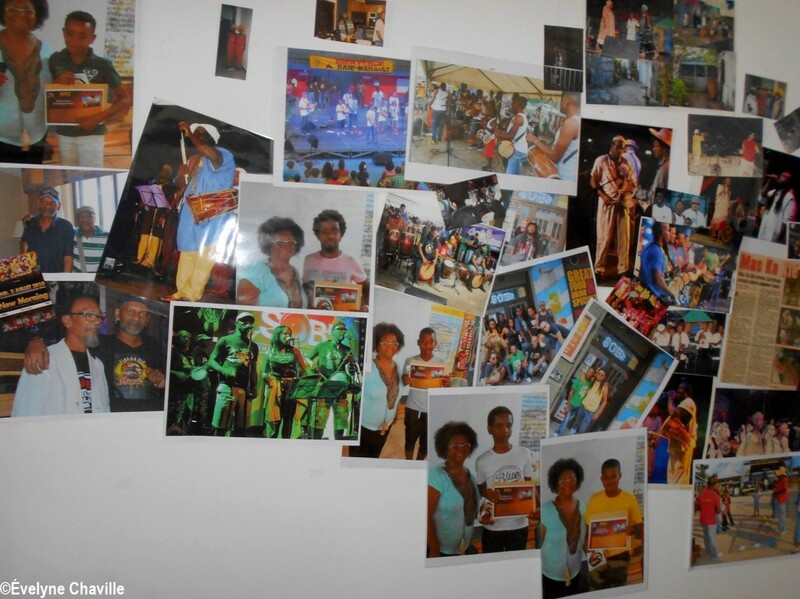 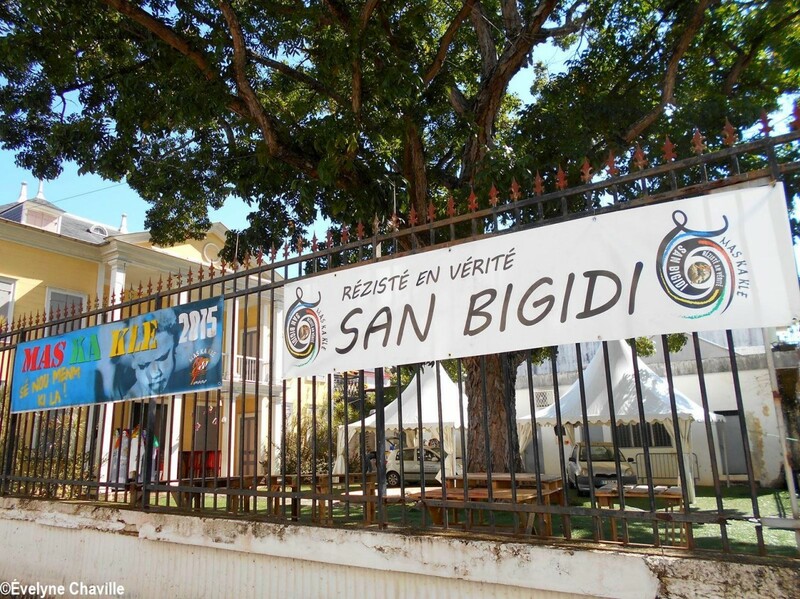 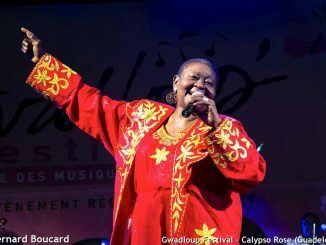 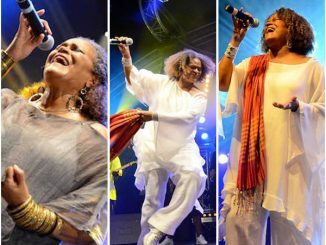 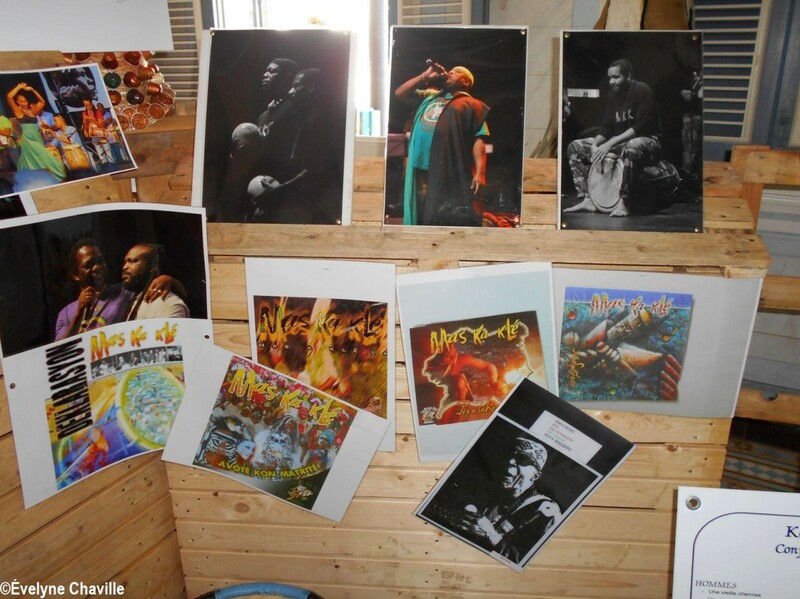 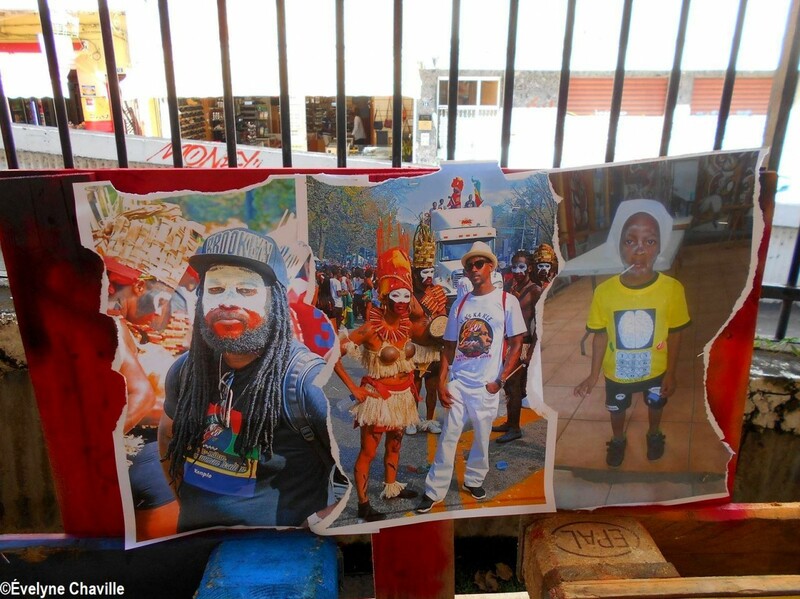 Festivals in the Caribbean : Guadeloupe must do better !